So cute and not expensive!! I used it on my bridal shower favors. They were so cute! 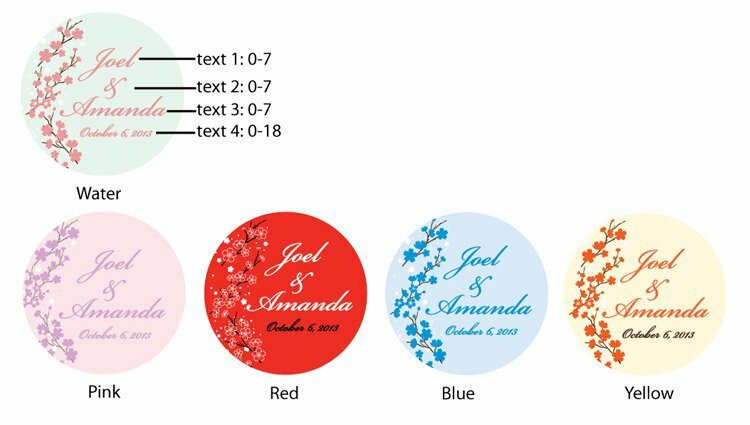 We personalized these labels for our daughter and son-in-laws wedding. We added them to our "candy boxes" for the guests to take home with them from the candy table. They were cute and personal. Labels were great in color, letters were printed clearly, not blurred at all. I would recommend this product. At our daughter's upcoming wedding, we have a candy table for that little extra something on the way out. 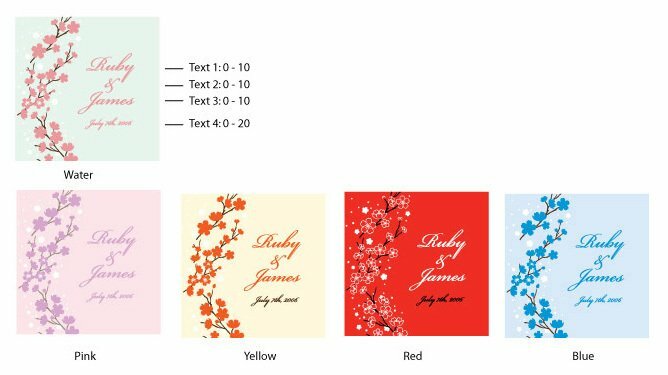 We will have plain white boxes for our guests to fill with candy and these labels will personalize the box with the bride and groom's names and wedding date. Very cute! Perfect size personalized labels for all of my home-baked/cooked gifts! I love to bake/cook for others and the labels really make the gift special. The perfect size for the favor. I actually used this for my daughter's first birthday party because its the only label that had enough characters that fits what I want to say. It turned out great and it fit the theme! Personalized labels are great our party boxes looks unique. We placed an order and a few days arrived it in perfect conditions, very fast, before we expected and everything is good quality!!! 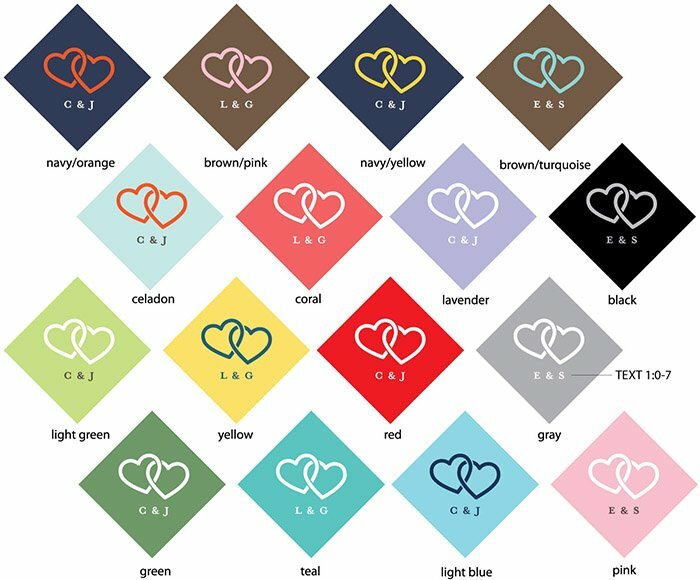 I apparently did not include the color of the sticker in my original order so I got an email from BC to confirm the color. Should not have been able to complete the order if I didnt pick a color. That part slowed the order down by a day or two. Thankfully, I got the order just in time. 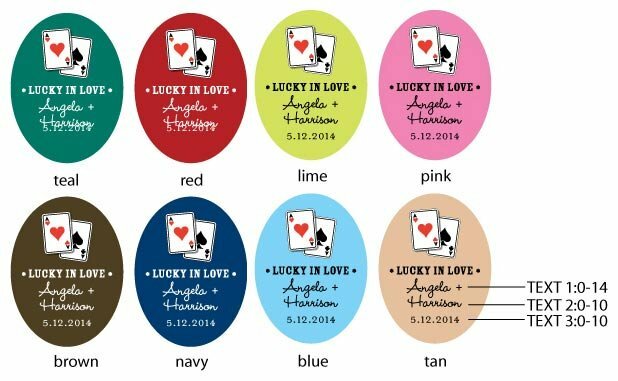 Stickers are high quality glossy stickers that I placed on chocolate gift favors. This were a great value and excellent quality. Ordering them saved us a lot of time in making them ourselves. I really liked these labels. I ordered them to put on favor boxes for a wedding shower and they look great and stick well. I'm going to fill the boxes with mms and the sticker is a great finishing touch. 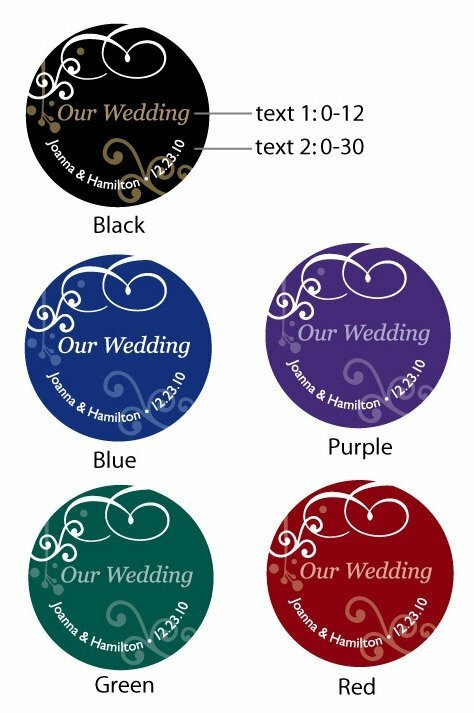 I used these on the stemless wine glass favor boxes to add a little color and further personalization. They looked beautiful. Neatly done, product has a wide variety of choices. I used them to label the favors and label the candy jars for the candy corner. The stickers look great on the favor boxes we're using for our wedding. These prices are great! I get what I want for a low price that can fit my budget! Tag anything for a party. Used these on paddle fans that we gave out at the ceremony. Personalized the fan. The only thing different I would do is order larger size. 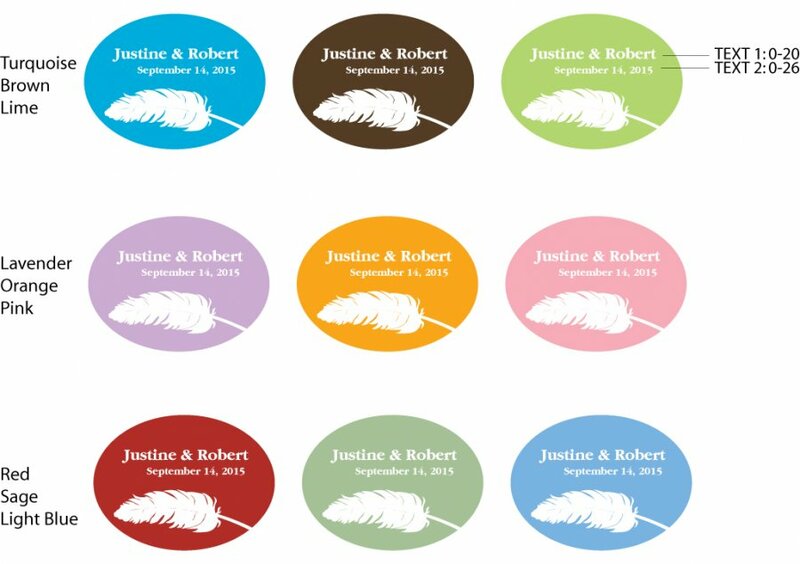 I purchased the stickers to go on bottles of bubbles for after the ceremony. They're much larger than I expected but fit the bottles even better than I had hoped! The stickers are really cute and I loved the personalization, but I thought they were a lot smaller than what I expected. We ordered the double happiness wine stopper favors and wanted to personalize them for the wedding. We ordered the labels which were easy to use, and I like that it has small cherry blossom flowers which fit well with the Asian decor. I used this product on all the different gifts I purchased from this site. I used these on the favor boxes at our wedding. They're cute and the color was great. 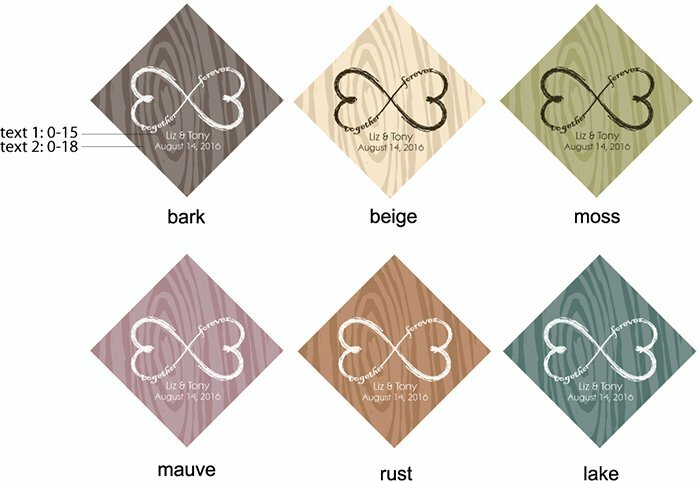 These labels are unique and add elegance to any favor. This is the third time I use labels from beau coup. I love them and you will too. The labels are good quality labels and priced fairly even at smaller quantities. A little big for the bubbles we used them for but acceptable. I would purchase this item again!! The product looked exactly like the photo. The labels fit exactly how we needed them. They were stylish and of high quality. Personalized. Affordable. Accommodated my needs! I really liked the personalized labels. There were so many colors and designs to choose from that it was difficult to not find what your looking for. Shipping was very quick and came right to my front door. 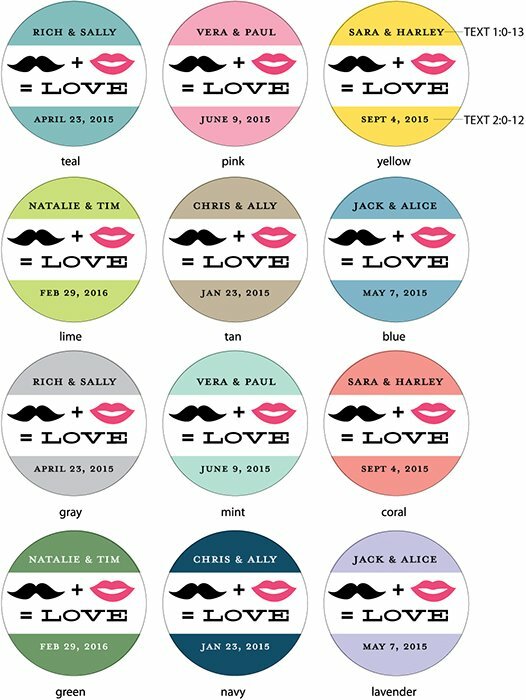 These are perfect for personalizing the Wedding Favors that will be given to our guest! Used on my favors. Matched our theme and looks refreshing. 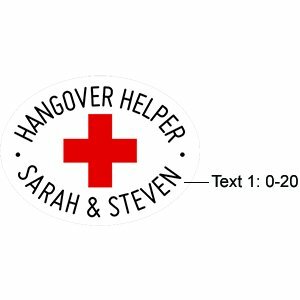 We used these labels on small bags of coffee for wedding favors. They fit perfectly and looked so professional. Best of all they were unique to the couple. The stickers were very cute and as shown on line. The problem was the print was so small and light that they were not legible or could only be read with a magnifying glass. Because of time constraints we used them but if we had time we could have done them ourselves. I would suggest providing a proof that is sized to scale. 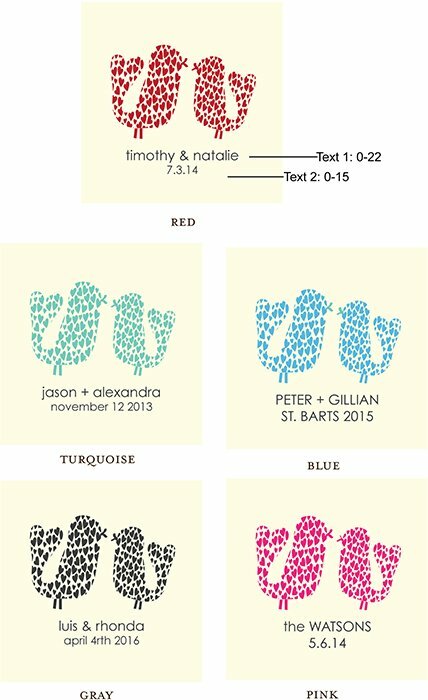 Also use different color ink for the personalization. 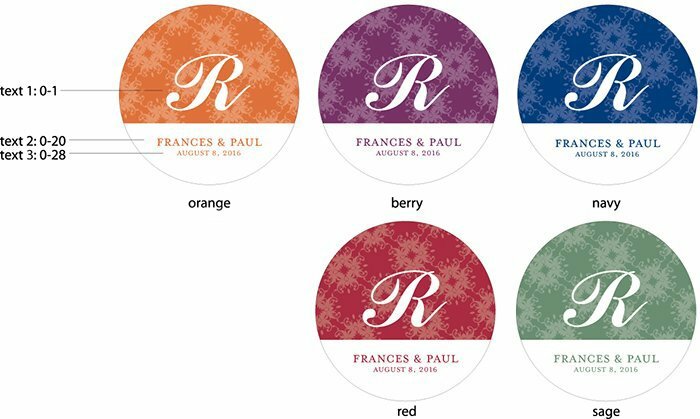 I am using this product for my wedding favors and at first I was a little hesitant because the "plum" on the screen didn't look 100% plum to me, however, when I received my labels in the mail them came out PERFECT! Kids loved this the thanks you notes. I would buy this again! Perfect! sealed the envelopes with a little flash! 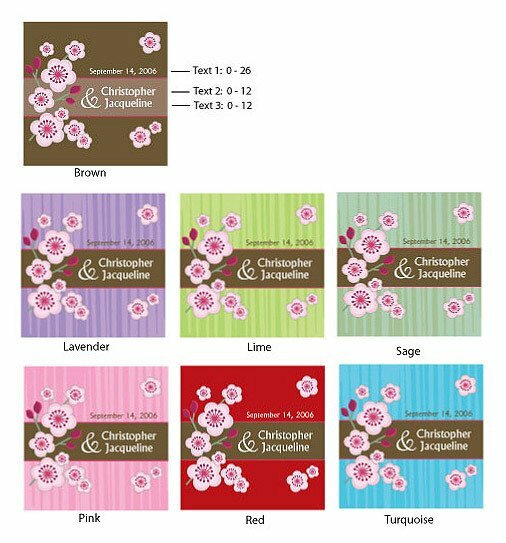 We ordered the cherry blossum themed labels for my sister's shower. We had candles wrapped for shower favors and placed the sticker on the outside of the cellophane wrap ... they were PERFECT and so very lovely! We also placed them on the prize bags for the shower games. Could not ask for prettier labels! We labeled jars of WI honey to place at tables for a CA wedding. 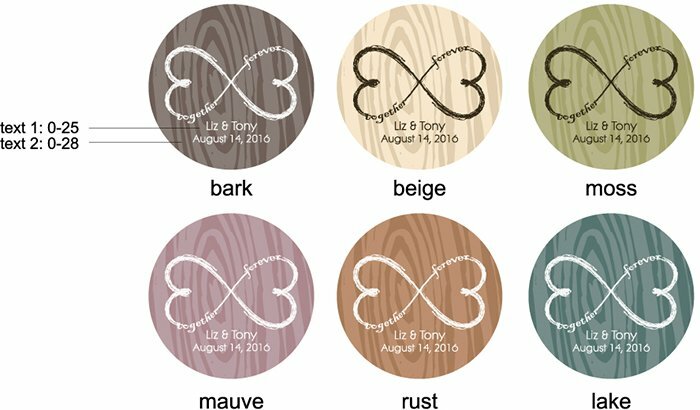 The personalized jar labels arrived very quickly, and matched the wedding colors perfectly. The guests thought that they were great! 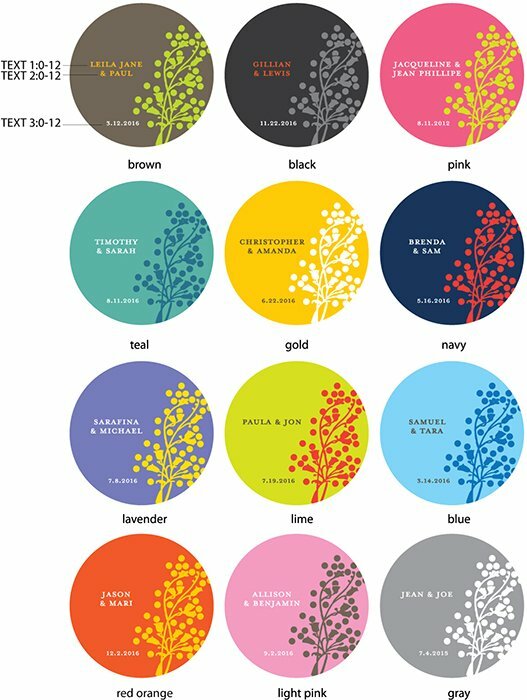 Use the trees for centerpiece for bridal shower and wedding. Put bride and groom names on the tress. Keep the same colors of the trees. Perfect addition for a personal touch to our Christmas gift baskets! The writing is, of course, a little small on the smaller stickers. I was very impressed with how these were packaged for shipping. 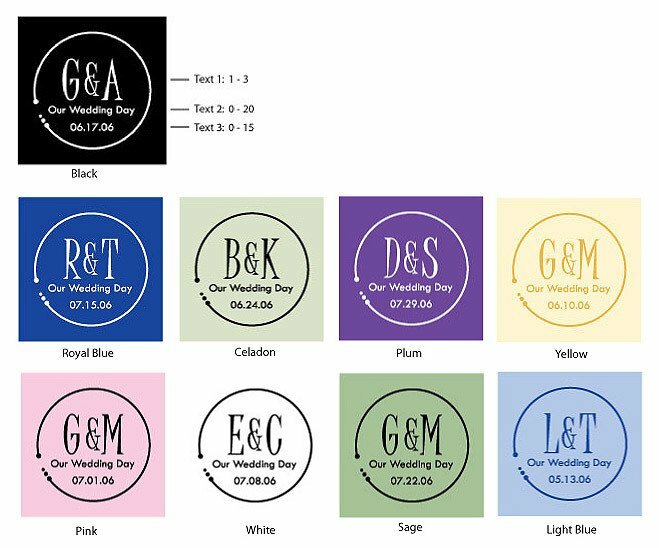 I was looking for labels for wedding favors and was pleased that the Beau-coup website was easy to navigate, that delivery was very quick, and the order was just what we wanted. I used these for my rustic chic engagement party favors and they look great! Quick shipping & excellent quality at a great value. Quick service, beautiful personalization, shipped with cardboard so they were flat when arrived..... couldn't ask for anything better! 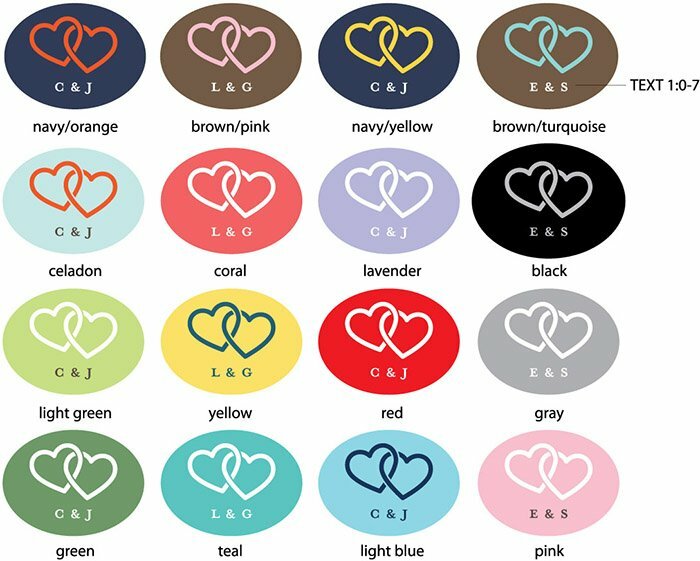 I ordered theese stickers to put on my wedding favors. I was so impressed when I saw them. They were so pretty. They were a little larger than I expected but they worked fine. We used the labels to decorate the box that held the gifts we were giving away. They made a nice accent! I bought these to add a personalized touch to my hand written thank you notes, left in my guests hotel rooms that are attending my destination wedding. They are adorable and nicely made! I had enough that I even used them on my gift tags for everyones beach towels and beach bags! 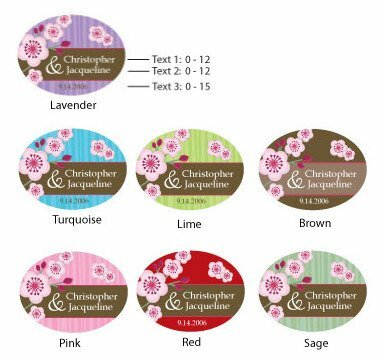 Bought these labels to go on the small glass bottles with corks for our destination wedding. Going to fill them with sand from the beach in Punta Cana and tie with a ribbon. The small round labels fit perfectly on the bottles. The writing is quite small, but still very nice. 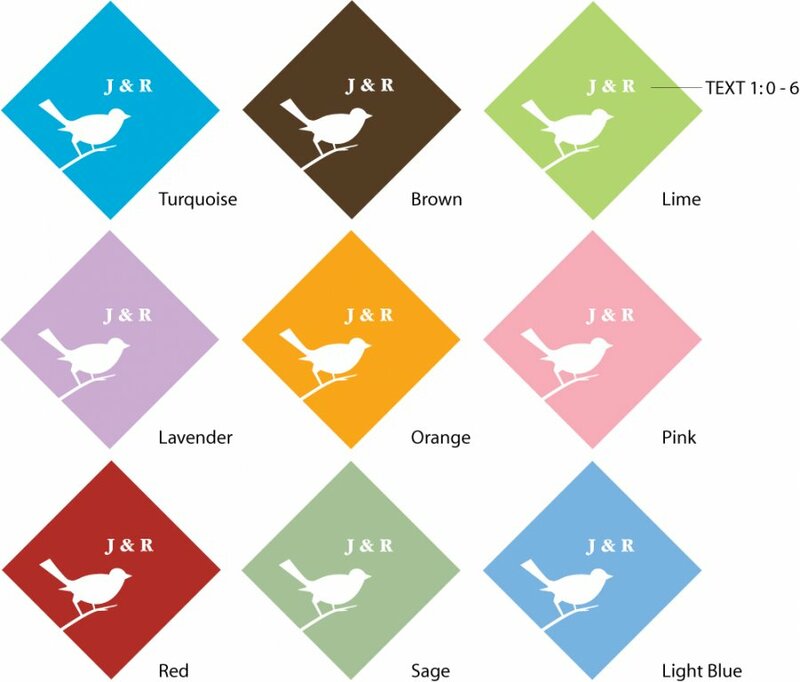 The simplicity yet elegance of the label personalized my business logo. I am very happy with the results! We used the sticker labels on candy bags that will be used for our candy station. I really thought the stickers were cute! They fit perfectly for our beach themed wedding! - I wish these were a "foil" type of sticker instead of a paper sticker; It would be higher quality if that were the case. These turned our nice, the colors happened to match our theme perfectly. The quality is good, no problems. Bride isn't into frills. These were perfect. Not a lot out there in gold and/or black. These were the right color theme and classy at the same time. They will be placed on the clear cake/cookie take home containers for the guests. I got these stickers to put on the bingo prizes for my future daughter in laws shower and they were a great way to say thank you. very good. have nothing bad to say at all. These were not cheap, but they are good quality and they were produced[...]. They are pretty, and Beau-coup offered more choices than any other site I found. We are using them to seal candy bags, and they are perfect for that use. They add a nice personalized touch to the party in a very easy way. I was happy to find these and would order them again. This is the perfect touch to decorate our favor boxes. They are the perfect size & shape and are easily affixed. They were a great size for our wedding favors and exactly what we were looking for. 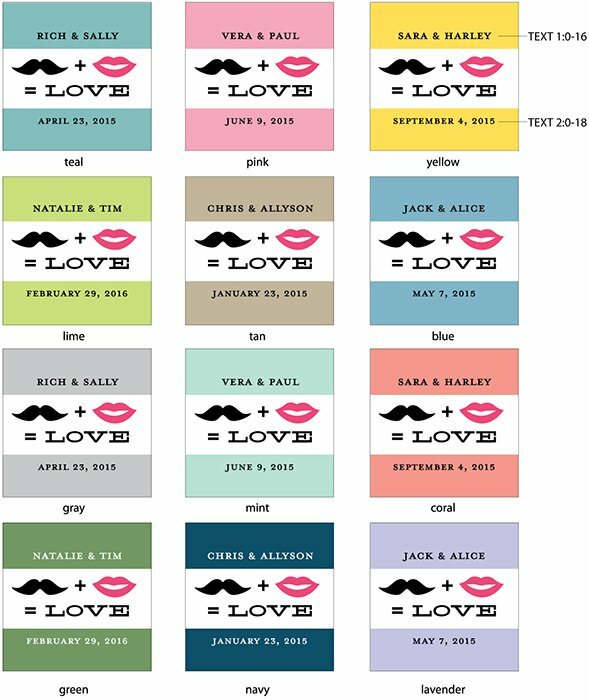 It was the right color, it matched my wedding colors perfectly; I will order the rest of my labels in a week or so! These were perfect for the self made first-aid kits. They were great and the perfect size. Personalizing a keepsake makes it more special! used these on the mini watering cans for bridal shower favor. 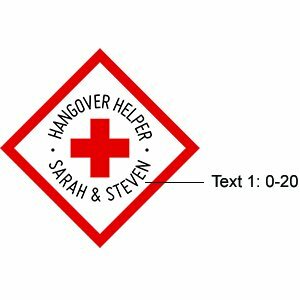 I ordered this label for my wedding favors. They are as I expected. The color is very nice. It stick very well on any kind of of materials. 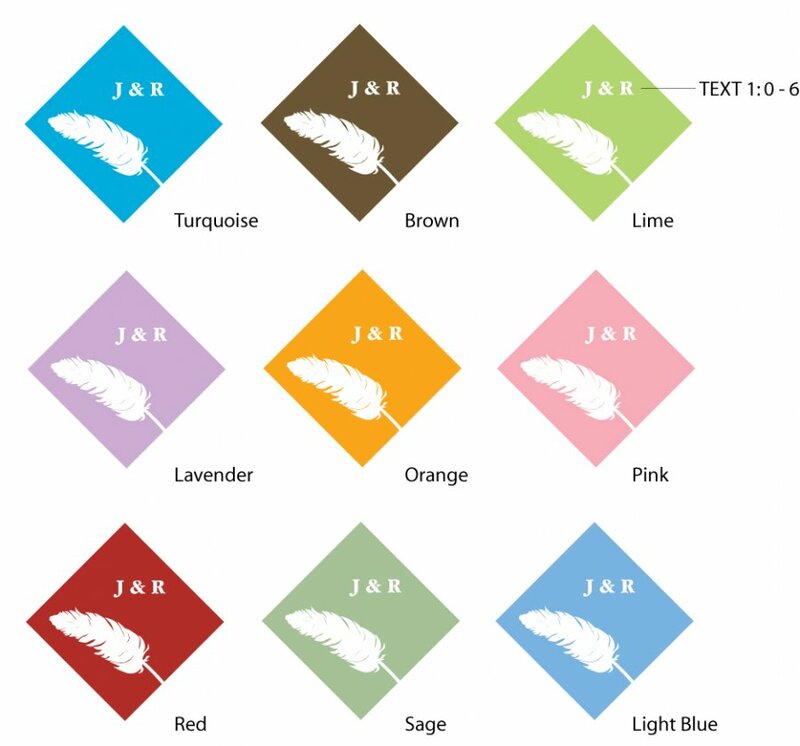 They will be placed on some favors I purchased. Love the designs. Will definitely order more next time! 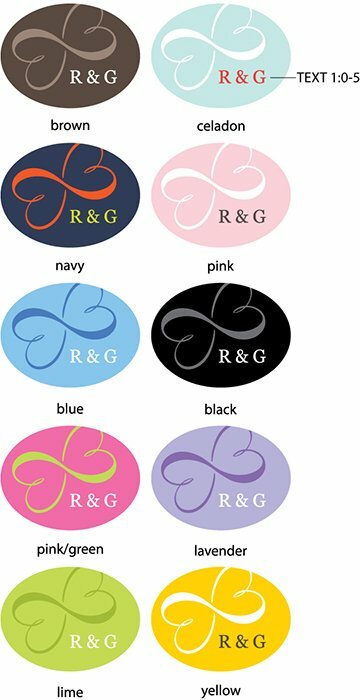 I am pleased with these monogram stickers I'm putting them on my wedding favors. Good value, disappointed in the color. I ordered purple. They are just as I expected. 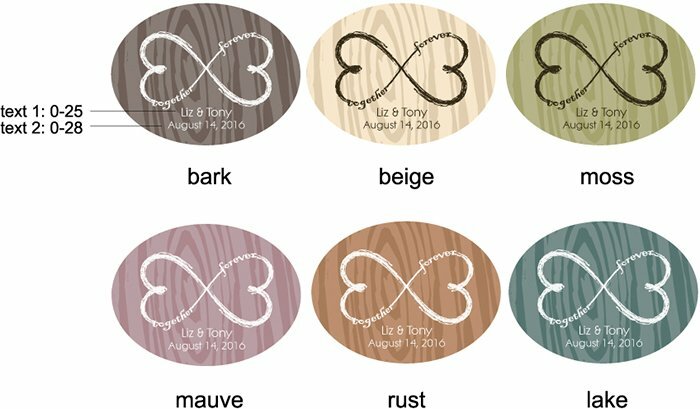 These cute little labels fit perfectly on our candle favors and match perfectly with our color scheme! Initially I thought the font was a little light, but when everything was put together, It worked out great. You don't want the writing to be too dark on your quests' favors. 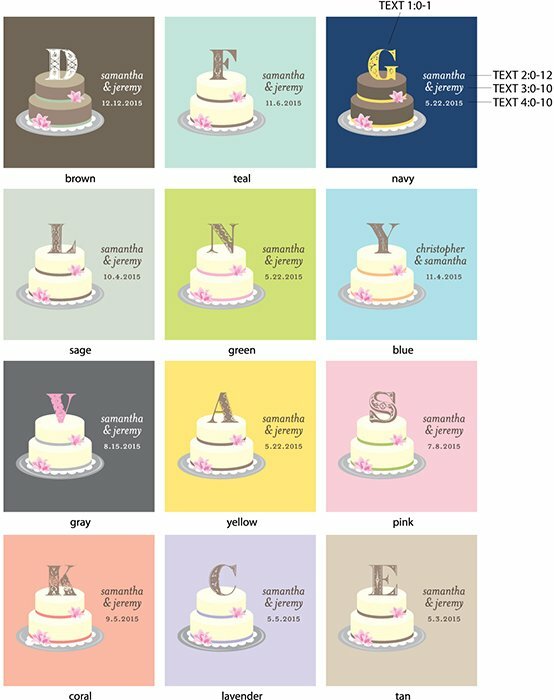 We rather have the colors go well for decorations and for the guests to enjoy the favors after our wedding! These labels are so GREAT! They are the most perfect label we could ask for , for our wedding! Great graphics & color! exactly how we wanted it!!! We bought these to use as additional closures for our wedding invitations. They look awesome! Great deal. I purchased the labels so that I could purchase bulk items to put in gift bags and be able to personalize them. I bought these lables for favor tins for my son's birthday party. They are extremely cute. I just wish that the last line imprint was in a darker color. The white did not show up well against the light green. I love using the stickers for my display cards I use for my bow business. They are a great size and very versatile! Bought these labels two years in a row now, and just LOVE them. 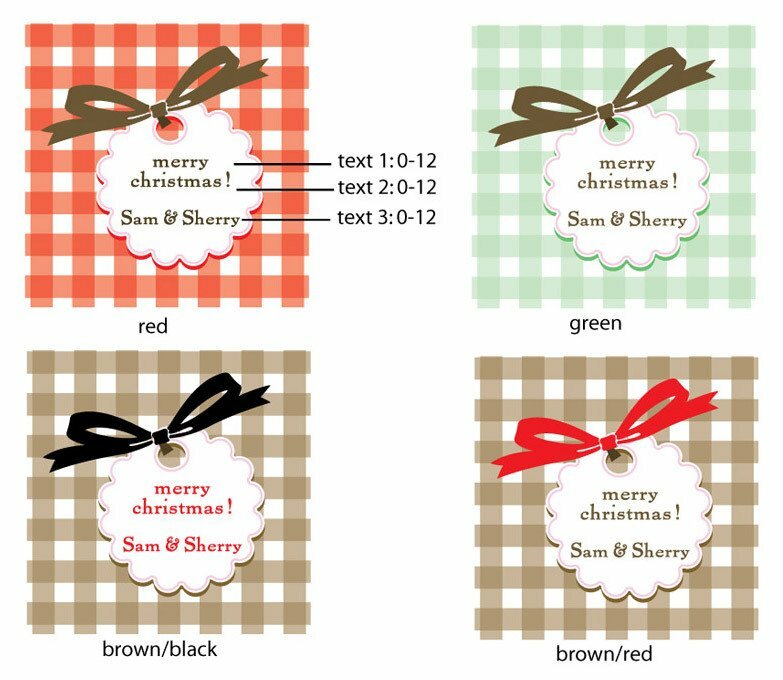 This time, I got some personalized favors for a party, but thought I might have extras, so I purchased these labels to stick on the favors after to turn them into "generic" holiday treats. The personalization really goes a long way! I appreciate the fact they you understood I needed my order as soon as possible and processed it with speed and efficiency adhering to the highest levels of quality. I shall hope to use your services time and again in the future. I bought this product to put on the take home boxes for the grooms cake. It worked out great! That way when someone took home a piece of cake they would see this cute sticker that said V & E (which are our initials). Very cute personalized sticker. It went great with the personalized ribbon. 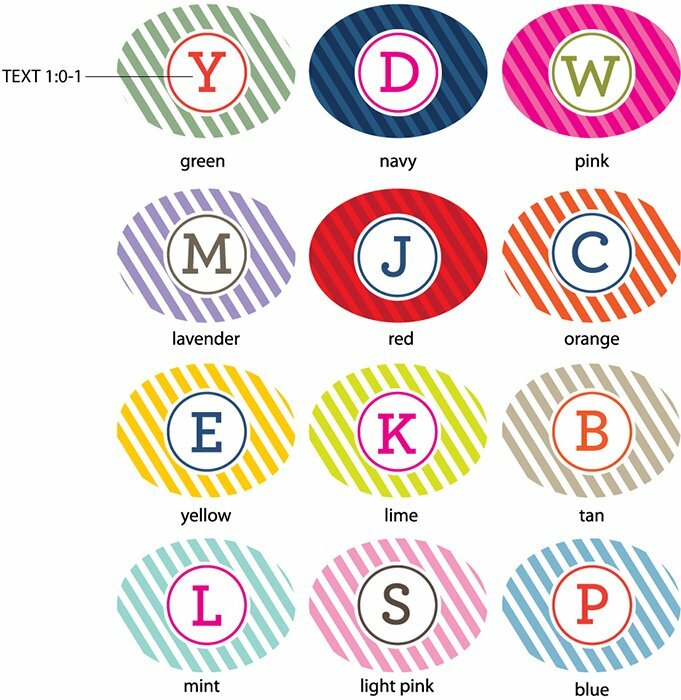 These labels are great, I loved that they came in different shapes and sizes. I can think of a million uses for them. These little sticker labels were perfect for the welcome bags at my wedding. They looked fantastic! I loved them. I like the quality of these labels. They have a nice semi-gloss finish. The colours and designs abound and I found I could coordinate them to the rest of the items that I purchased quite easily. The colors and design went perfectly with our cherry blossom theme. I will put them on my travel candles for the welcome bags, put them together in minutes and look great! Vey nice product. Just as advertised. I used this product to attach to my daughter's clear plastic pouch candy bag favor for her communion. I ordered multiple coordinating colors and they really looked great in a basket. These labels were great. I personalized them as 'Save the Date' and I stuck them in a picture frame and gave them away as favors at the engagement party. They came out very nice, I was impressed. 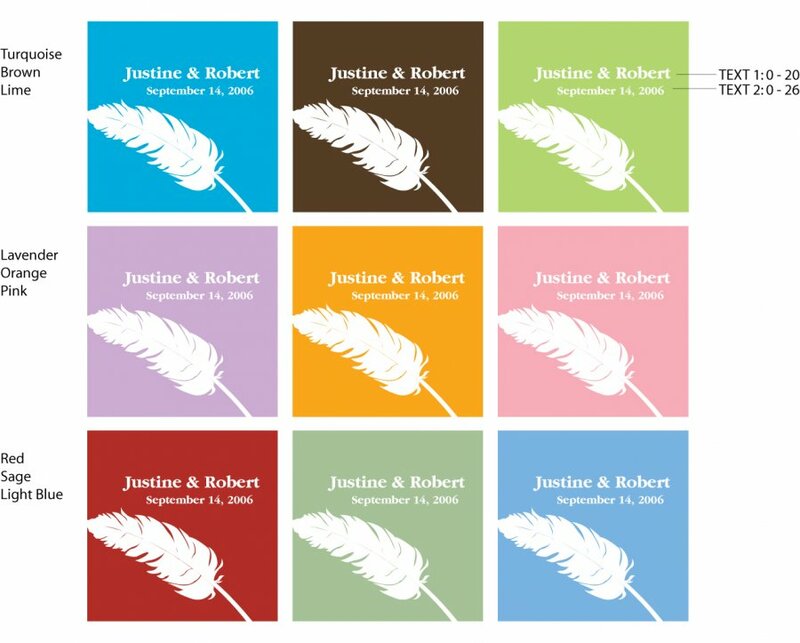 We ordered these for the covers of our wedding CDs which we are giving to our family as favors. We really love them and they make the gift look much more thoughtful and expensive than plain cases would. So happy we went the extra step to purchase these! 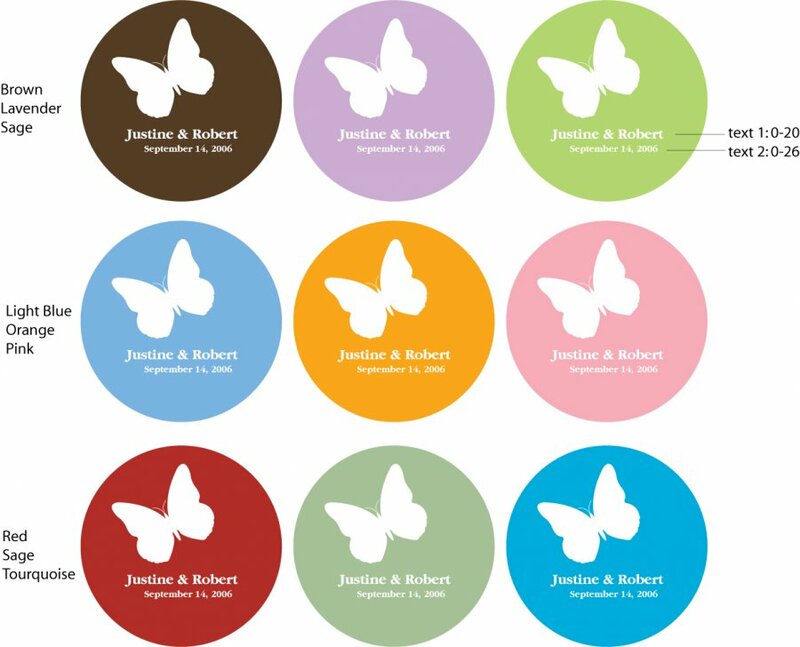 We used these round labels on our wedding favor 2x2x2 boxes and it was perfect. Only thing I wished they would have had were more "lovebirds" instead of just one bird. I USED THESE FOR THE FAVORS WE HANDED OUT AT OUR ENGAGEMENT PARTY AND NOT ONLY WERE THEY UNIQUE AND ADORABLE, BUT THEY MADE PREPARING THE FAVORS A LOT EASIER ON US! Beautifully done! Loved the colors and so easy to use! My daughter had a candy bar at her wedding. We purchased clear plastic bags for the guests to put their candy choice in--and these labels gave a plain clear bag a little oomph! I used this product on making CD favors. It seemed to be the right finishing touch!!! The labels turned out better than I expected. 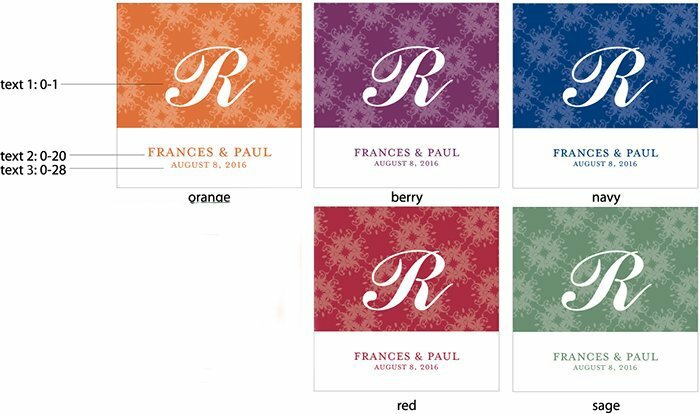 The design was perfect for the candle favors for my wedding and fit the Renaissance theme of our wedding. I am having a huge candy bar at my wedding. I put these stickers on the candy bag, as their "favor". They are excellent quality and I LOVE them so much. def worth the money! Love these stickers. We had to cut a lot of things out of our budget, but we were able to get beautiful stickers because Beacoup had such good prices. There weren't a ton of choices, but we love what we got. They are bright, colorful and good quality. Couldn't have done better. We were looking for something cute and inexpensive for the favor boxes and these were perfect! These labels are very classy, especially given the price. They quality is very high. They fit perfectly into the theme of our wedding. These labels were great and really pretty, but didn't quite lay flat on the candle. I doubt anyone else noticed though. Great buy! 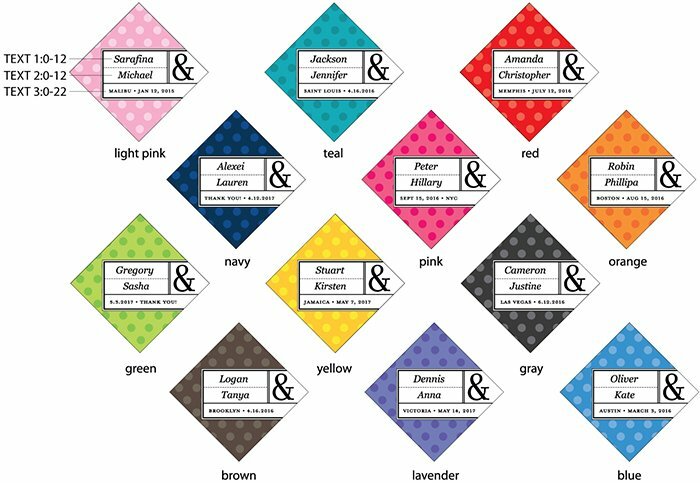 I ordered a sheet of labels for my wedding shower favors and was extremely happy with the results. The color/design choices were very cute and exactly what I was looking for. Great way to personalize your gifts and for you to keep around the house! The custom labels were fun and unique. 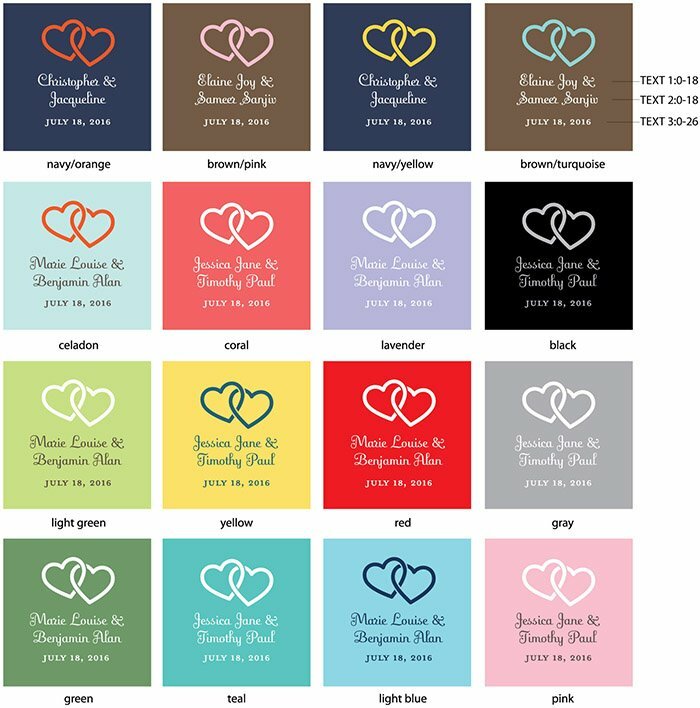 I loved all the options that I had to choose from and was able to find the one that fit best with the theme of the baby shower I was throwing. I threw a tea party themed baby shower and bought cute tins to put the leftover loose tea in as favors. The labels were fun and made the tins a nice keepsake for the mother-to-be and her guests. Very happy with this purchase! And the bride loved that they matched her color of orange (a lot of the oranges are fall colors, not spring). Plus the design was very cute! Thank you!! The stickers were a great quality, they were reasonably priced, [...] and in general, I was very pleased. Would order from beaucoup again. Great price with your personal touch. The Labels were exactly what I wanted for my favors. Even though my first choice wasn't the same label style it was okay. There customer service reps. called me back with recommendations on what I can do with my labels. I loved the color, size, writing, and the service. 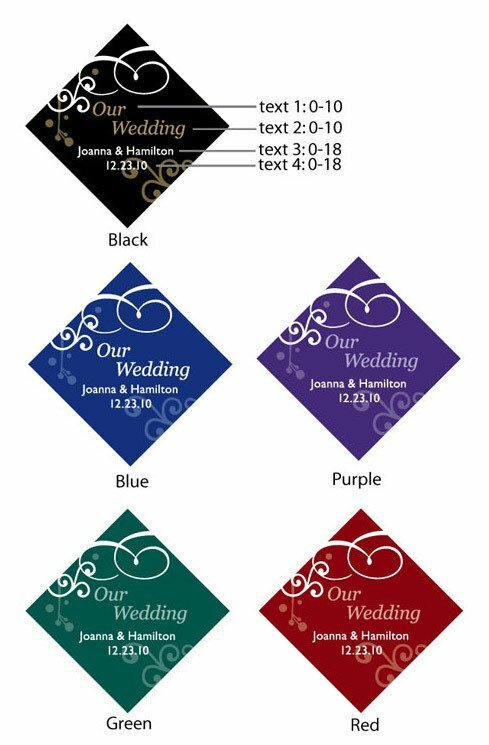 I would recommend it to anyone that is on a budget or trying to be creative for there wedding favors or invitations. This is the second time I have ordered these labels for different events. This time they went onto the mini gable boxes for my sister in-laws baby shower. It was a welcoming baby shower, so I had the babies name and birth date written on the label. 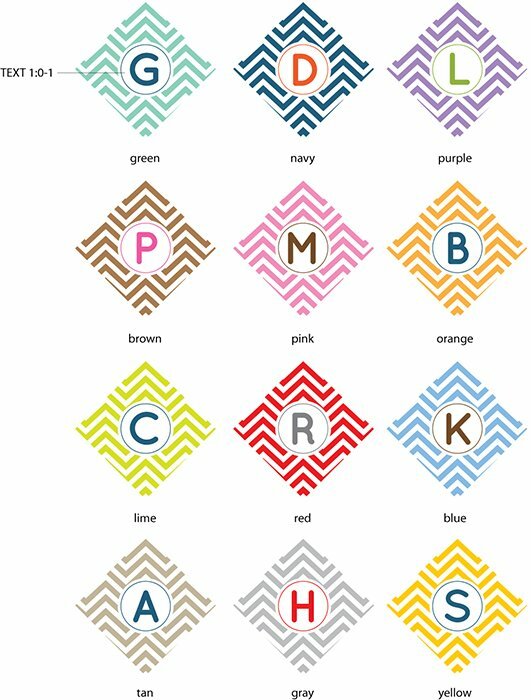 It added such a personal touch to the event and brought in our theme color and we used the babies initial as the theme as well. I was on the label for the favors, cake, and cupcakes. It also now will be a keepsake because I also made recipe cards of the cookies that were in the gable boxes for favors and the labels went on the cover. It made a simple favor look elegant, expensive, and unique. 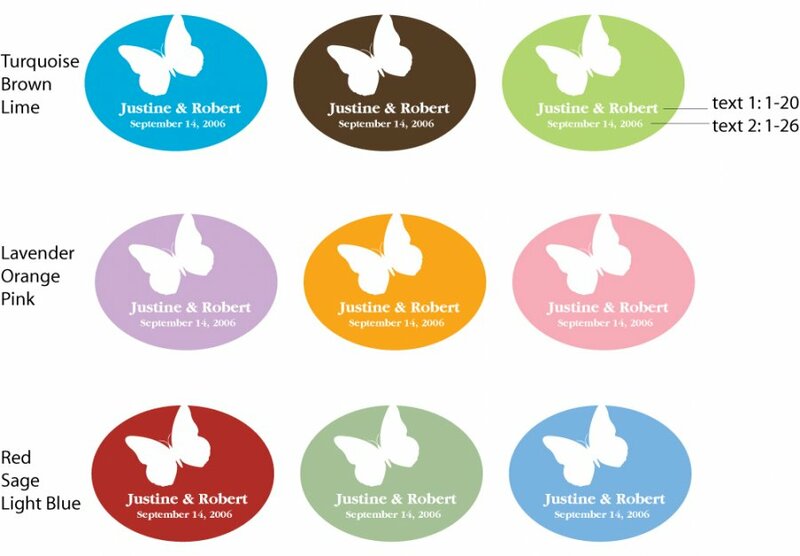 I also bought these labels for my sons baptism and put them on a cellophane bag of cookies as the favors as well. Such a special touch to any event or party. 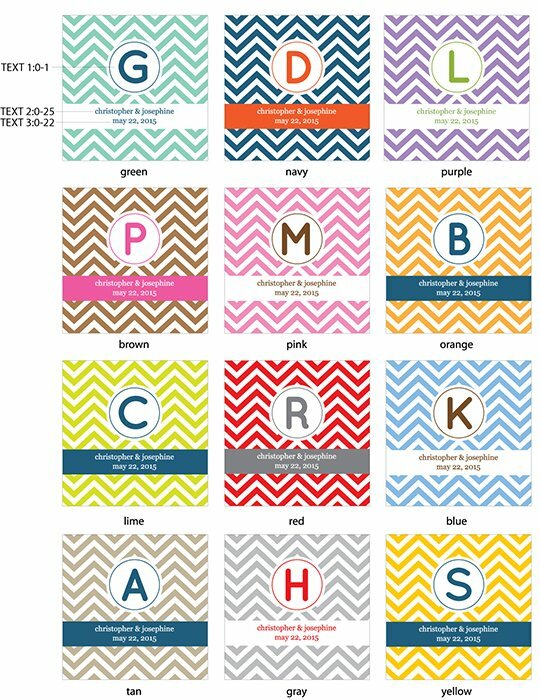 I will be ordering another set for my sister baby shower in June! I would buy this item again and again! I planned and organized a spring luncheon for the women on my mother's side of the family and our theme was "Honoring Our Roots". 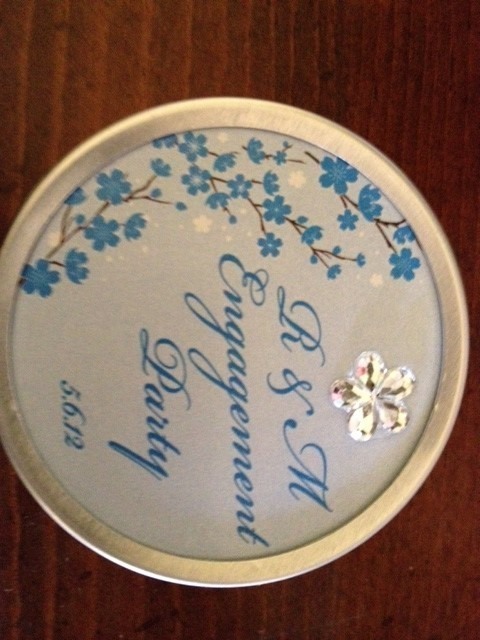 I used little round tins with seed tape rolled up inside for party favors. The tops were decotated with a silk gerbera daisy and the planting instructions were on the labels I got from you. We put them on the bottoms of the tins. 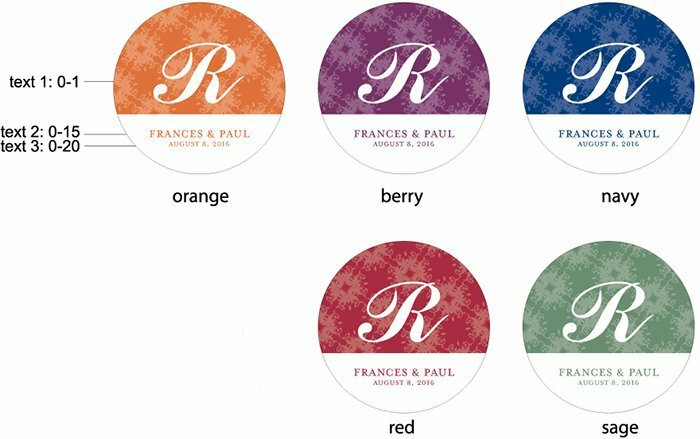 The colors of the labels were a perfect match with our color scheme and the perfect size to personalize the favors. 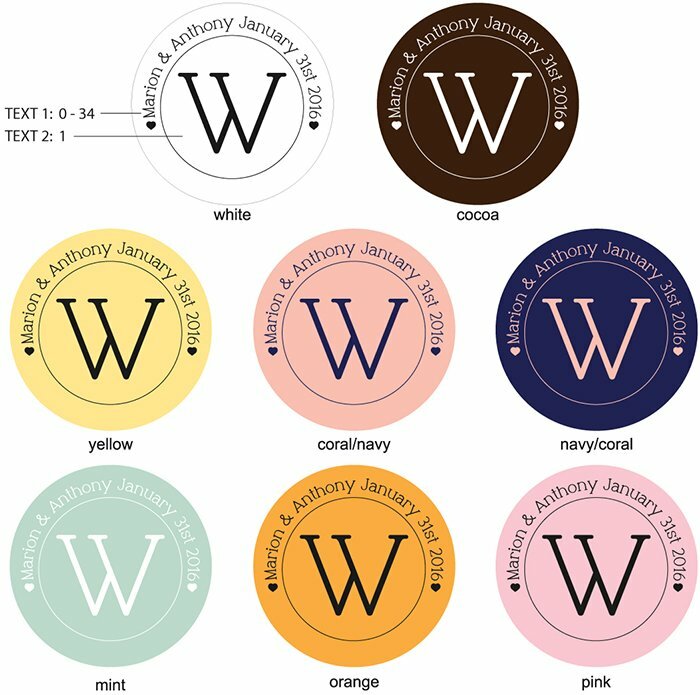 I used these labels to stick on mini Johhny Walker Black bottles for a B-Day party, this was the Guest of Honor's favorite drink. I wrapped the bottles in celophane paper and use the label to finish the wrapping. They looked super cute! Love the beautiful labels, better than expected.Very high quality.[...] labels were really expensive. Used these labels to decorate the Chinese take-out boxes. Loved them. Great colors, designs, etc. 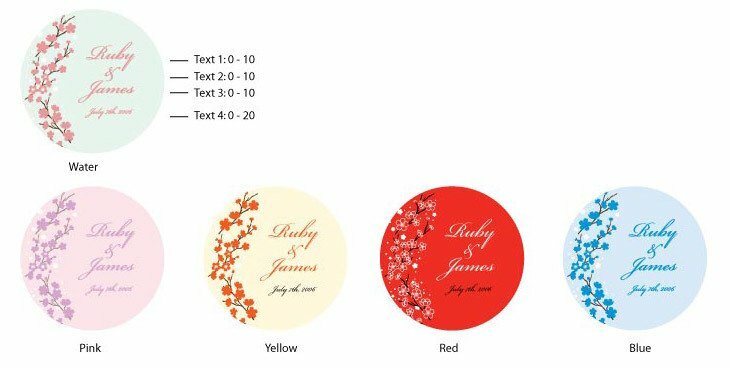 The only drawback was that I couldn't use the color and design of these labels to coordinate with the selection offerred on the baby shower candle tin favor. 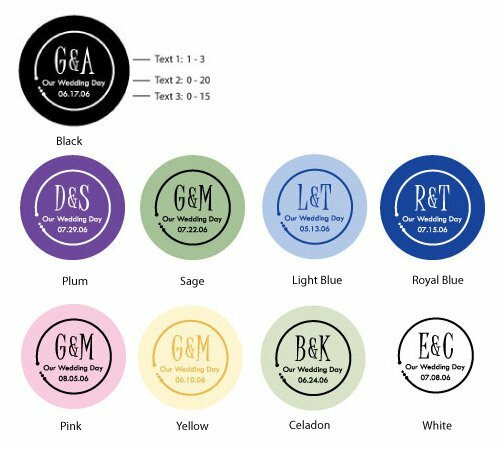 Perfect for anything you want...I am using them on the candles we ordered! Great "Thank You" Labels on Bags to fill for Wedding Reception Candy Buffet. They were easy to decide on with our colors...They look great! And really add a professional touch to favor bags. These labels were the perfect touch on our Christmas gifts this year and received many compliments. They are an affordable and professional finish to homemade gifts and foods that everyone loves! I used these for my husband's 40th birthday party. I attached them to the mini candy dispensers. A great finishing detail piece! Very Cute stickers. Exactly as described and pictured. Worked perfectly for our bags of candied nuts. These labels are fabulous! 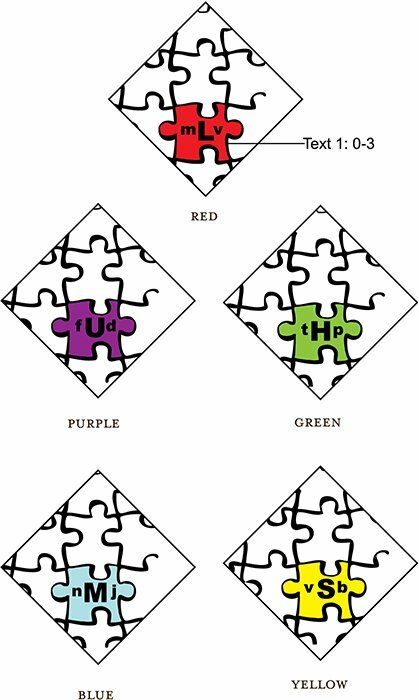 you can customize them to match party themes. I also use them as gift labels. I used the product on teacher gifts. They were a hit! 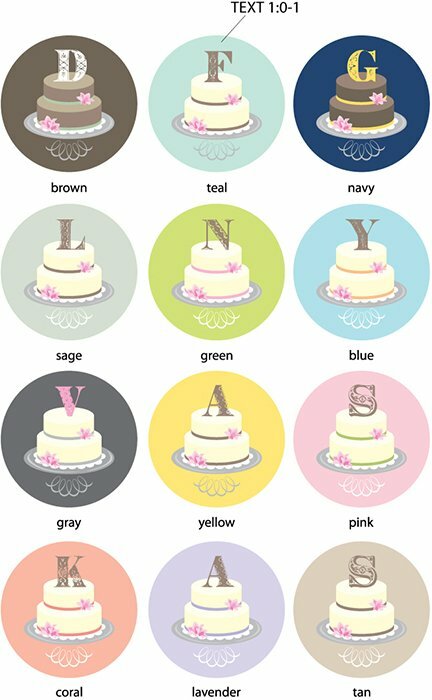 I plan to use the labels for cupcake boxes that will double as dessert and take-home favors for a pre-wedding reception in July. We LOVE the stickers we ordered! They were perfect to send with our Save the Dates for people to use to mark their calendars/date books. The ONLY thing I didn't like is the one we chose (our favorite) only had room for personalizing our names and the date.... we really wish we could've added the location of the wedding, as we are having a destination wedding. Nevertheless, we LOVE our stickers and couldn't be happier with them! 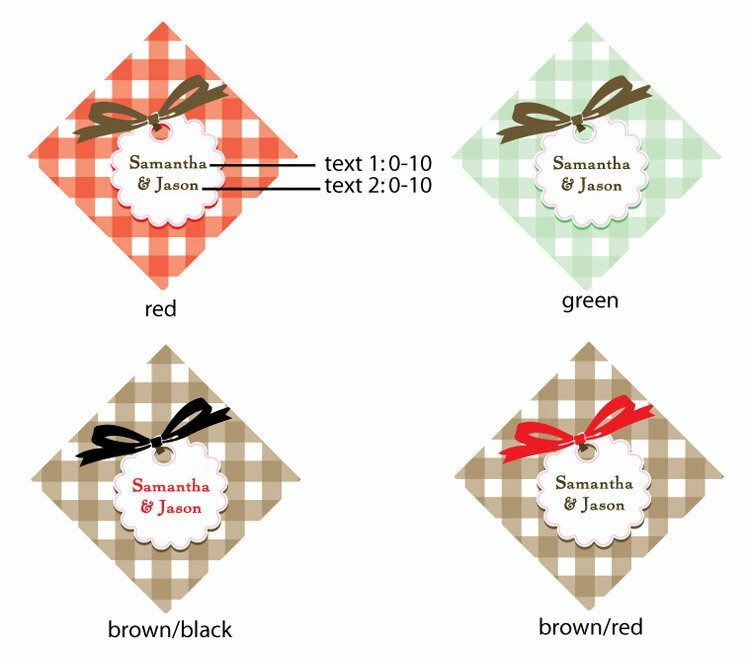 We are considering purchasing more to use to personalize our favors! Goes perfectly with our style! We bought the little vanilla scented travel candles and put these on the top to personalize them to give them away as favors at our reception...very cute! I used the labels for holiday gift labeling. My ONLY complaint is that I was not able to preview my personalized label before I purchased it. That would be a great feature for your site so customers could review the size of the label they are ordering as well as the font and the personal message. I love these labels, they add a personalized touch! This is the second time I have purchased them, both times for birthday parties. Both times they were a big hit! The labels worked out great! I was pleased with them. I purchased the oval ones, and the font type was a bit small. I only had a small area to cover and couldn't go any larger, otherwise I would have ordered one of the larger stickers. All in all, just perfect! Very cute, but the glue should be stronger. I used to close the pink mini purse. It was pretty, but didn't close it very well. I made a personalized label for my daughters 1st birthday. I used it originally for the favors but ended up using it to close my thank you card envelopes. I loved the design and how professional it looked. I used these labels to make a personalised travel emergency pack for a girls week away. They were fantastic! They fit perfectly on the candle and we were able to personalize them to fit our theme! THE CANDY SCOOPS I ORDERED WERE PERFECT, VERY UNIQUE AND ELEGANT. 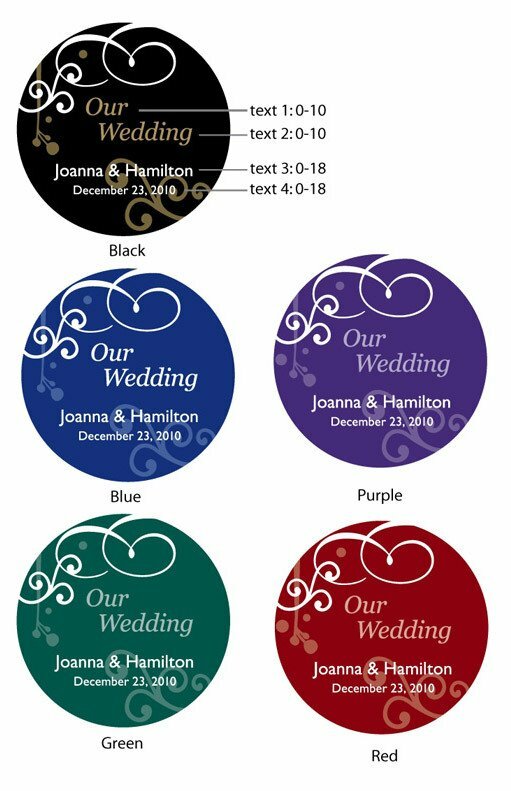 We were looking for a "favor" label that would be personalized and would fit our wedding theme...this label was a perfect fit and we were very pleased with the product. The color and design went with evrything at the wedding. I used the labels for my wedding favor boxes and they looked great and fit perfectly. I loved the labels and they came so quickly and were as perfect as I had hoped. Thank you! I have now ordered these for the third time! I personalized gift baggies for my daughter's First Communion. Secondly, I used them to wrap plastic silverware at this season's football tailgates. Now I will use them to personalize all my Christmas gifts. A great product for all occasions! We used these labels on the gift bags for our guests. They really made very simple bags appear much more stylish and jazzy! Your customer service was excellent. 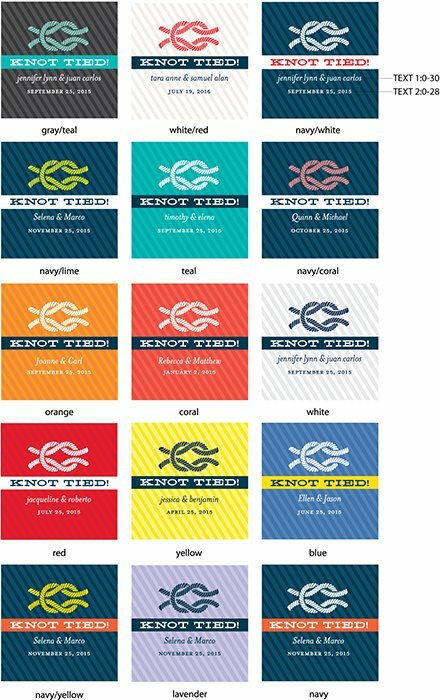 I had ordered labels from another company and was very disappointed when they arrived. I should have ordered from Beau-coup from the start!! [...] Thank you so much!! Everyone at my wedding loved the personalize touch from this product. I was so happy with everything. Thanks for making such a great product. We used the labels to personalize good bags in our wedding guests' hotel rooms. Everyone loved them and kept the bags as keepsakes. We ordered extra labels to personalize other items in the future. 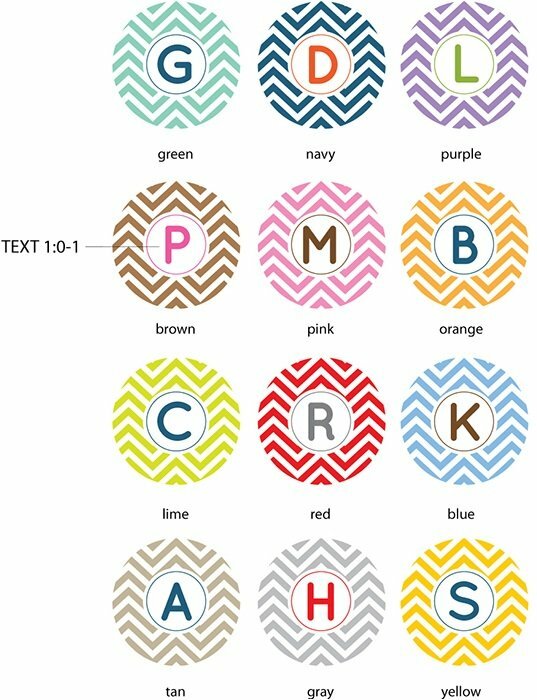 Great, simple way to personalize anything! Perfect addition for our beach wedding! 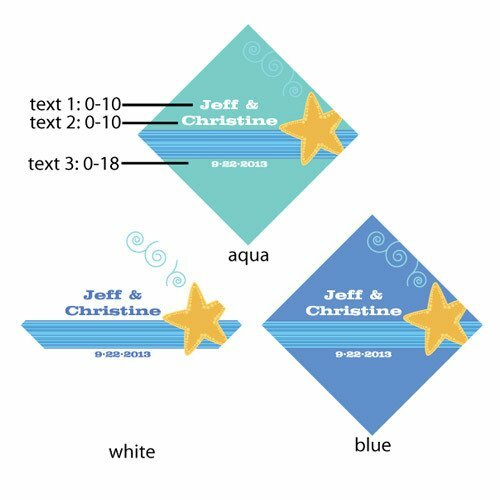 I ordered the starfish design in blue (circle cut) to go on our gift bags to our hotel guests. We were having a destination wedding [...] and they were absolutely adorable! We did an all white bag with white tissue & placed a sticker on the front of each bag. They were an elegant but fun accent for the guests of our beach wedding! 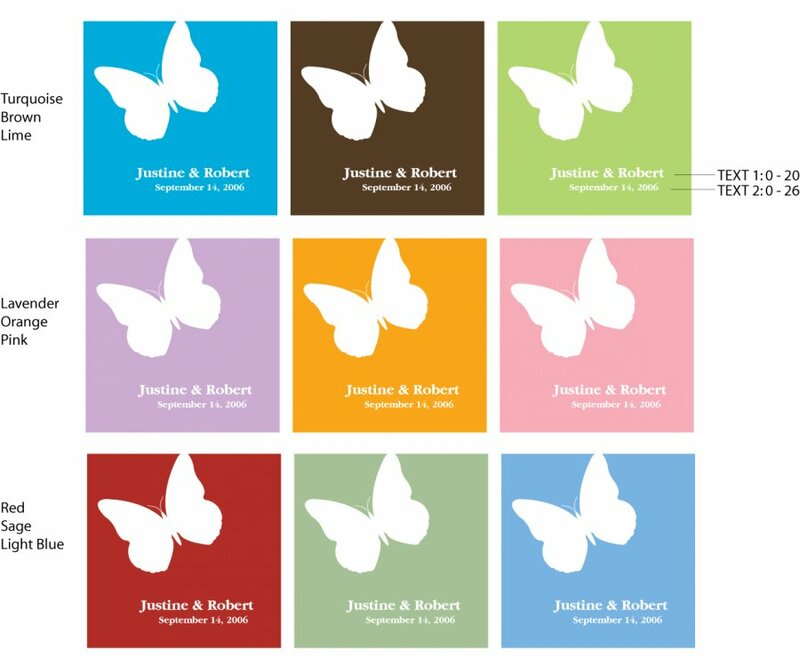 We used these stickers both on our thank you cards and our favours. They were great - the design was exactly as shown on the website, and they were very well produced. [...]. 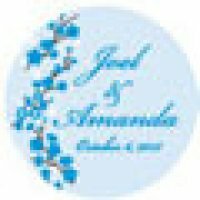 I would definitely recommend this website and these products. I got married in France, and searched Europe and US websites, and these were definitely the nicest. Cute and unique labels that look nice on my favor boxes. 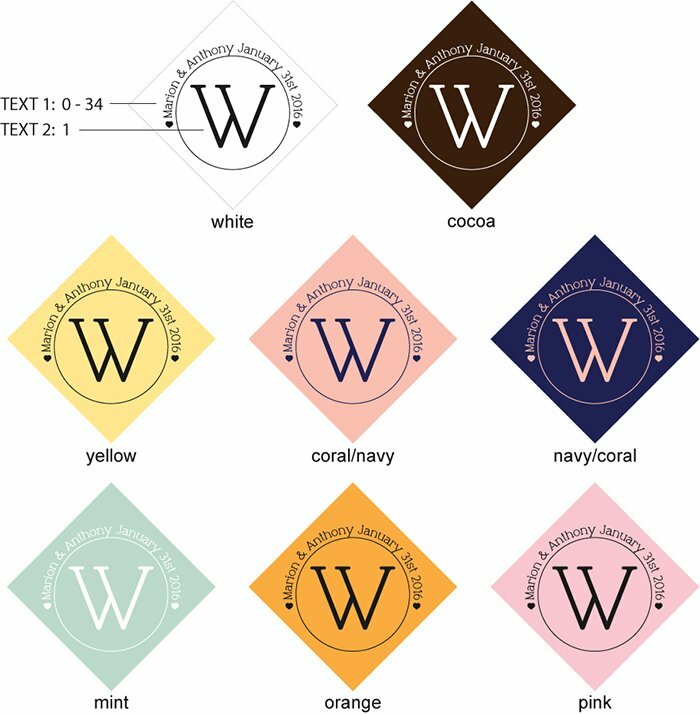 I ordered the brown and green orchid labels. The only downside is that the colors are not as vibrant as I thought they'd be, especially the brown. The labels personalized family reunion favors. I used these for the favor boxes for my sister-in-law's bridal shower. They were perfect...I knew that they would be; I had ordered some of the same lables for my wedding 6 months ago. 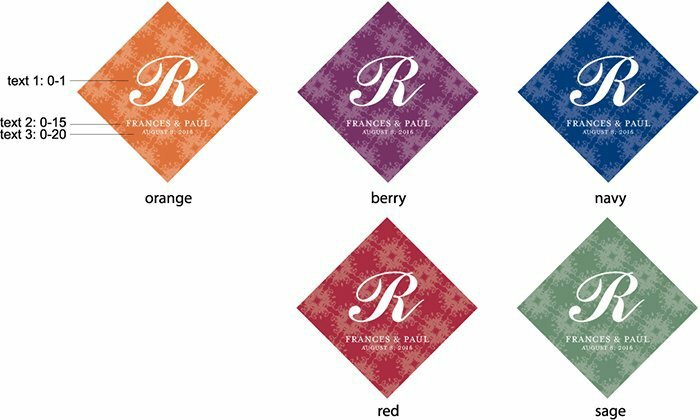 These labels worked perfect for my business [@] I do designer candy buffets and I wanted labels to attach to the boxes that I provide my clients. These were wonderful! The size was perfect, the style was exactly what I was looking for. [...] Also the other lables I had ordered were awful, over priced, and behind my timeframe in which I needed them by. We had known for a few months that we wanted to have small favor boxes with Jelly-Bellys stuffed inside them for our July wedding. After purchasing what I thought were decent favor boxes from a major craft chain store, I discovered they were very flimsy and needed tape/glue to stand up. After folding a few boxes, I quickly learned I needed something else. A web search led me to Beau Coup and we've been delighted with EVERYTHING we've purchased so far, and we've saved money. Beau Coup's products are far superior than anything that I've come across in malls/stores. [...] They were exatly what I was looking for in quality and size. Very sturdy, cardboard like, with easy perforations for folding. It took minimal time to fold all of them, and my fiance even helped! We completed the ivory favor boxes,stuffed them and wrapped an eggplant colored ribbon around them, securing it with a Beau-coup custom monogram label. Our favors were perfect for our July wedding and we received so many compliments on them. Thanks Beau-Coup! 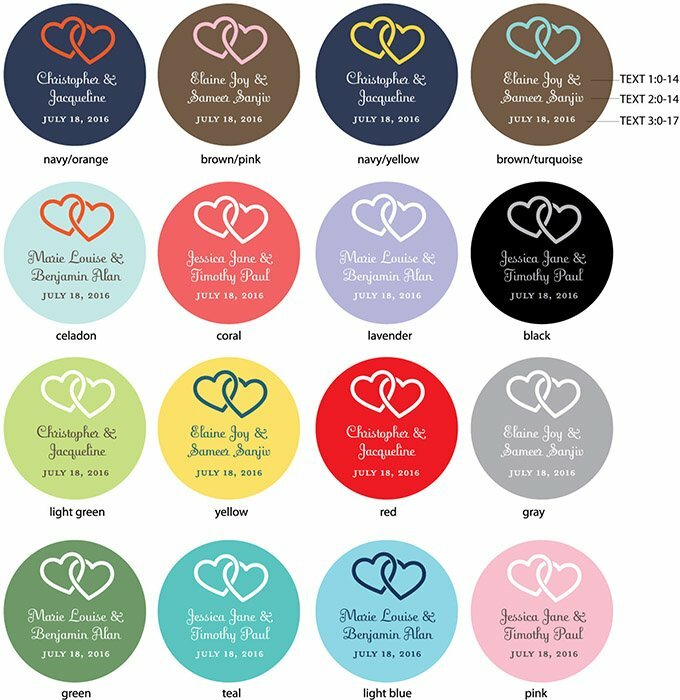 These labels are absolutely darling! These labels are just perfect! I could not have been happier with my purchase! The colors were an exact match to the website. The bride was knocked off her feet by them. I used the labels for the shower favors and gave the leftover to the bride for thank you card seals. She was so touched! Thank you Beau-coup! 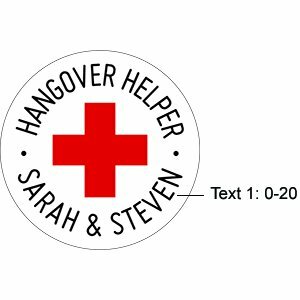 I ordered these labels to go on the keychain tapemeasure for my husband's 40th B-Day favors. The labels were great! Great quality, colorful, and not so pricey. The company worked GREAT with me to work out the wording on the labels. Would definately reccommend. 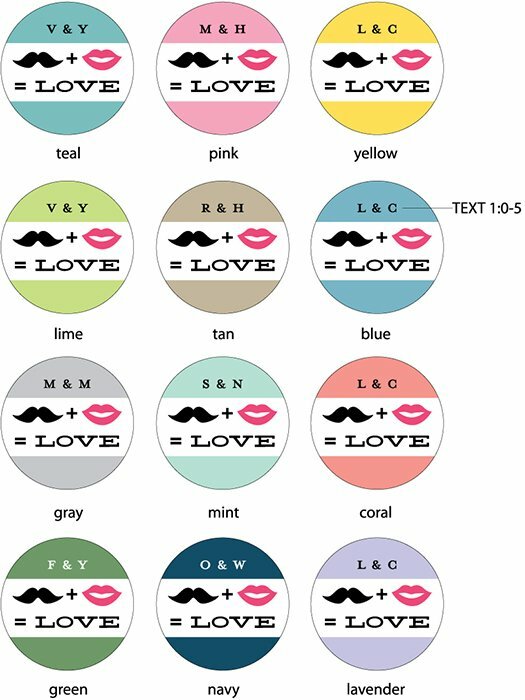 These labels turned out GORGEOUS and really added to the emery boards I provided the ladies at my ladies night. Thank you! Needed these at the last minute and I got them just in time! They turned out great and were just the right touch to the gourmet cupcake mix boxes. 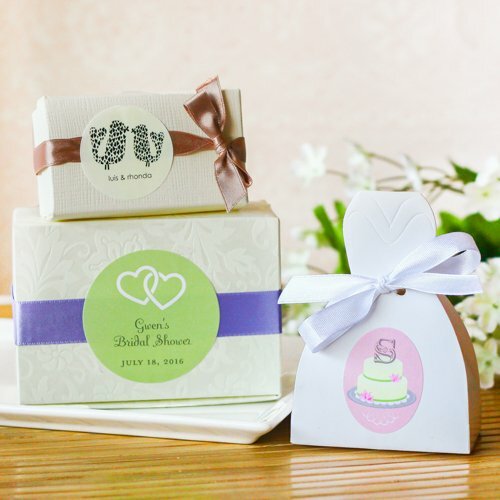 The Best Bridal Shower Favors Ever! I purchased hand lotions and soaps, applied the tags to bring everything together. The favors were ok on their own but the personalized tags made them perfect. Every guest asked where I purchased the tags and said I must have paid a fortune for them. I told them the website but said as far as the money the bride to be was worth every penny. They don't need to know how much I DIDN'T spend on her!!!!!! 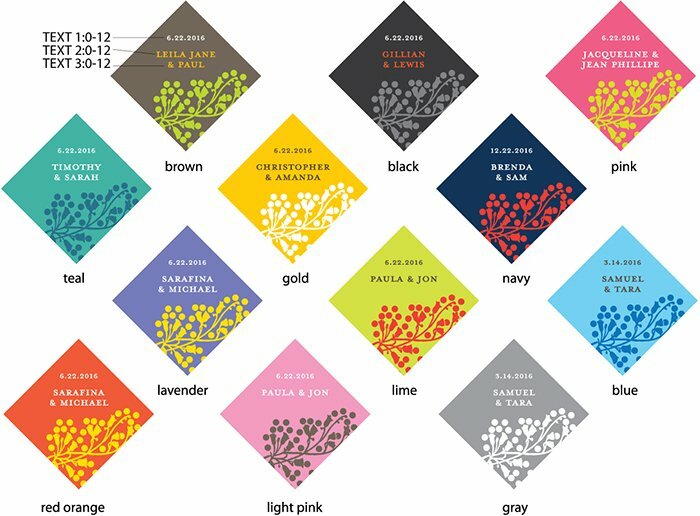 I needed labels asap for my wedding favors! They were speedier than I expected. I would order from them again! Perfect for the thrifty shopper! I used this on little "ziplock" bags for birdseed for my wedding reception, and have recommended this to several of my friends who were looking for something similiar. I have gave them this weblink! The price is awesome for the quality and QUANTITY! Definately a great purchase! 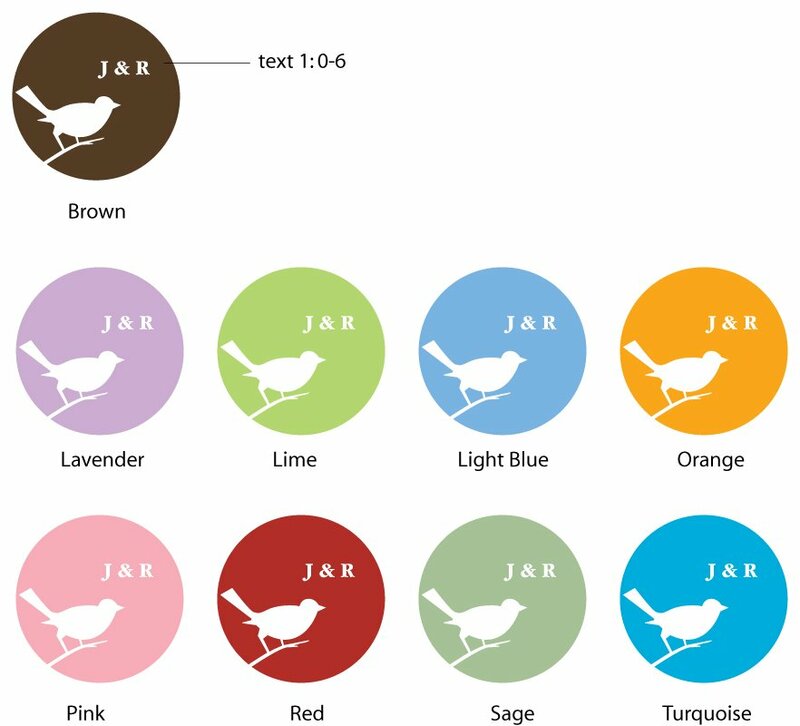 I ordered the oval stickers with the bird design (in lime). They looked great on the chocolate brown boxes for favors (I filled them with a couple truffles). 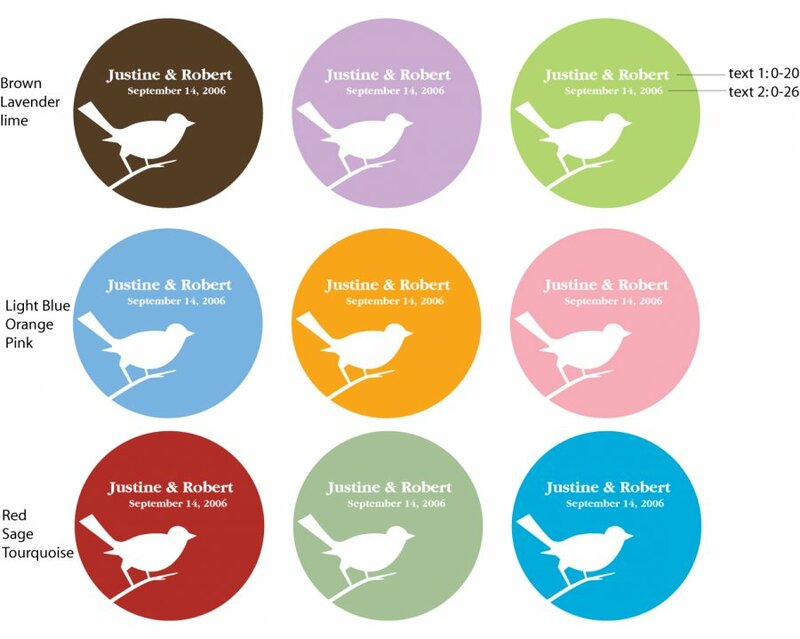 The bride did a logo with 2 birds for the wedding, so the single bird was perfect for the shower. She loved it. Looked very professional. 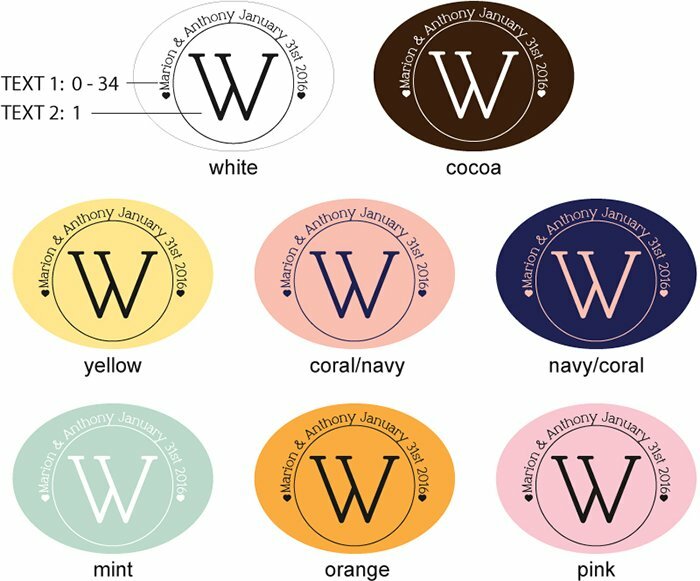 I ordered your labels for my Caribbean beach wedding. The price was great as was the quality. The colors were brilliant [...] My only regret was not ordering the bigger sized labels because the tin pails I labeled were bigger than expected. Thank you Beaucorp for making my day. This was great to personalize Bridal Shower favors. Great format and very easy to order. I was looking for an inexpensive way to design the welcome bags for when guests check into the hotel. I found brown gift bags online for about 25 cents a piece and then put these stickers in the center of the bag. It's a fall wedding so I love the brown bag, but the red sticker is just gorgeous and makes the bag look custom made! 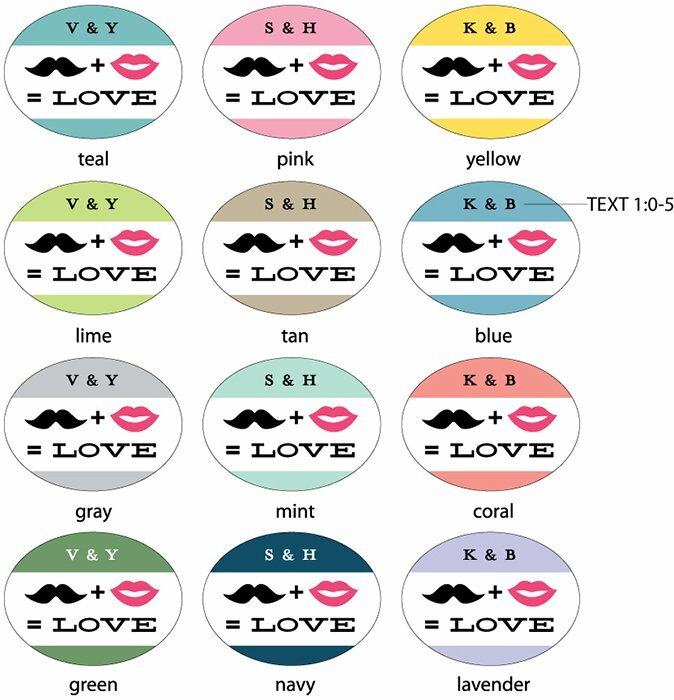 I wish they came in a bigger size, but they come in so many different colors, and you can choose what you want them to say. I absolutely love them - they stick to the bag really well too. perfect for personalized favors. they are unique and affordable. These labels were the perfect accent to my bud vases and praline candies. My guests thought they were adorable. They were beautiful! My husband and I received a lot of compliments on them and they made our unique favors even more unique! 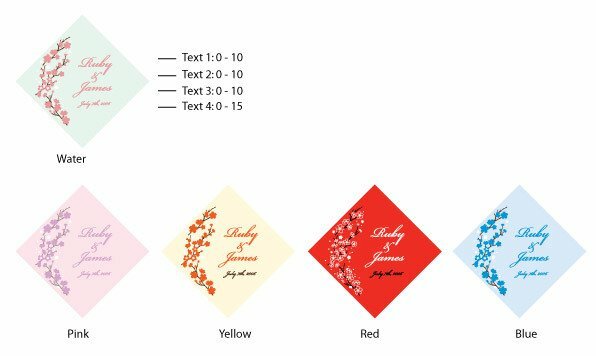 I used these labels to tape ribbon around my favor boxes for my wedding! Adorable, definitely the colors and orchid flower I was looking for to compliment my theme. Used to wrap birthday favors. I was very excited when I came across these personalized labels. They go perfectly with my wedding theme and there were several sizes to choose from. We don't know our wedding date yet, so instead of putting our names and our date I got them personalized with "Thank you for coming, Love (our names)". I will be putting them either directly onto the favors or on the bags, but either way I know they are going to look great! I used these stickers to make Welcome Bag Tags and they look wonderful!! We used them for our daughter's Baptism invitations and favors. Expensive but makes a big impact. We bought the red and orange starburst labels in the round 2 inch form. We placed them on 16 oz white Chinese food take-out boxes that we will use for our wedding candy buffet. The labels were the perfect size and with the wedding almost 2 months away, I am confident that the stickers will stay in place, even though we restacked the boxes inside one another. My one con is that I expected the labels to be glossy and they are not really, thee color could be more saturated and there could be more sheen. I used these products for labeling bridal shower gifts. 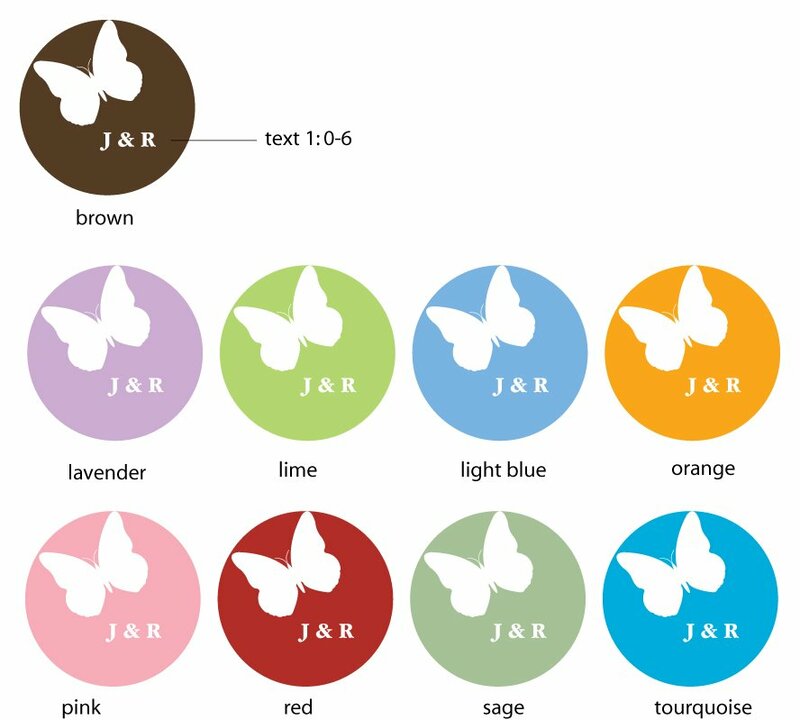 I had bought the gourmet cupcake mixes for my friend's shower favors, and the labels looked great on them. 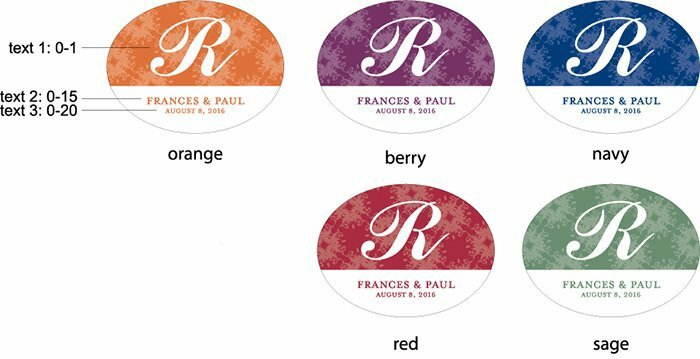 I ordered 2 different sets of labels (same design, different color), and varied them between the favors. They were a nice detail for the favors. The labels were the perfect size for the little embossed bags. The style I chose matched the style of invitations. There was a large selection and they came in beautifully! I will order these again! I loved it, I used these labels to put on glass votive candles, and they look great. Makes my party favors look great, and unique. 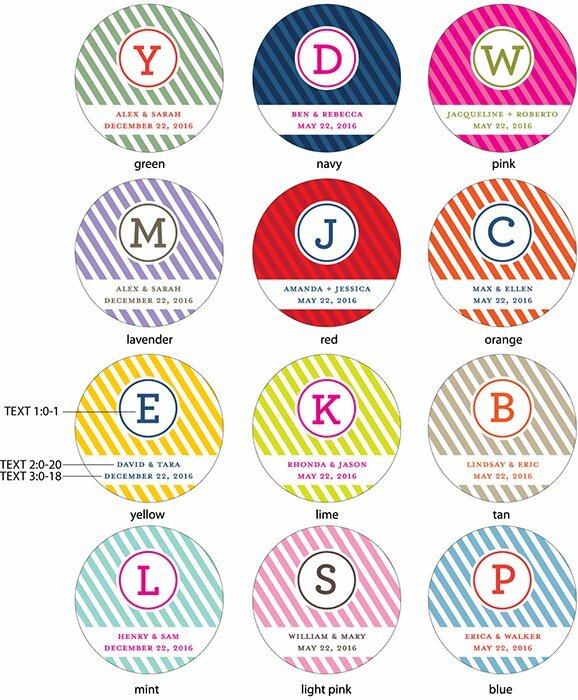 The round labels were really cute! 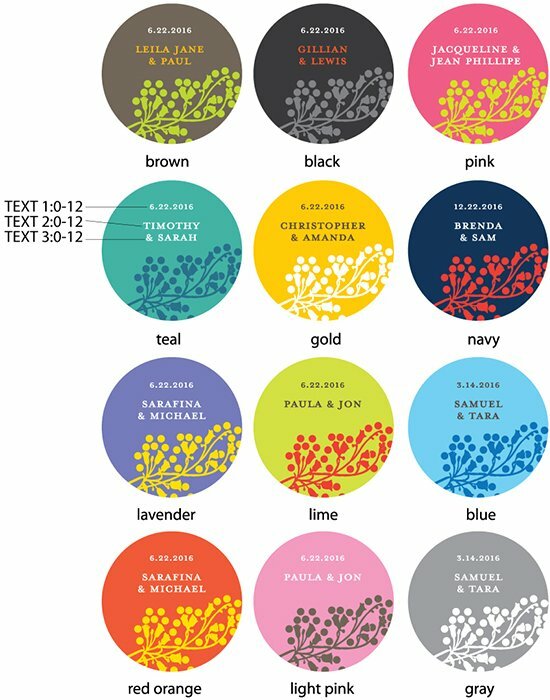 The round labels were perfect for the tops of the favor jars at my wedding. They made a simple jar...adorable. I wanted to add a little something extra to our gift bags and a few other things and this just gave it that extra touch! 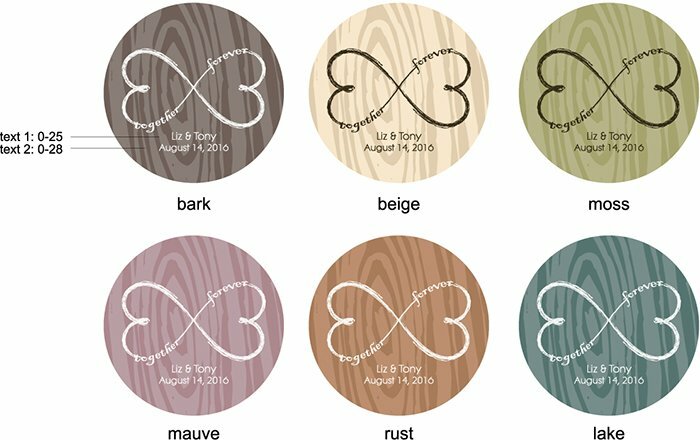 I added these beautiful personalized labels to candle holders for wedding favors that everyone loved. I used these on my wedding favors which were little glass jars with our favorite spice rub in them. They added a nice personal touch to the favor and the stickers themselves came off the lids easily if the people wanted to reuse the jars for something else later. 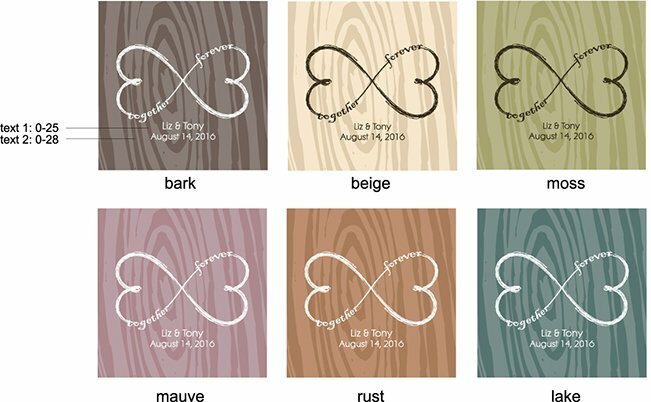 The labels added to the presentation of the braidal favor gift! Too hard to pick only one style !!! My labels are being used on the gift boxes I give to my customers. I'm a jewelery designer and needed stylish labels for those boxes mentioned before. As I had used your labels for my kids birthday favor bags, I decided to have them made for my business and it has been a hude success. Thank you for you excellent service and to help me shine ! 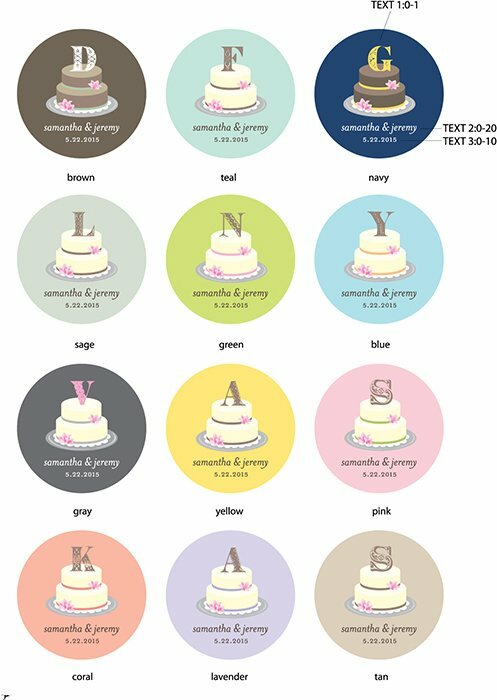 Great labels to use for weddings! 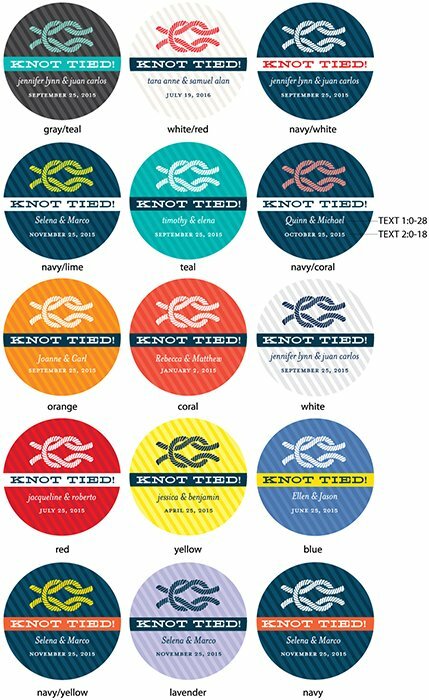 I bought some labels for my summer wedding. I placed them on top of candy boxes. The looked great and were easy to use and order. 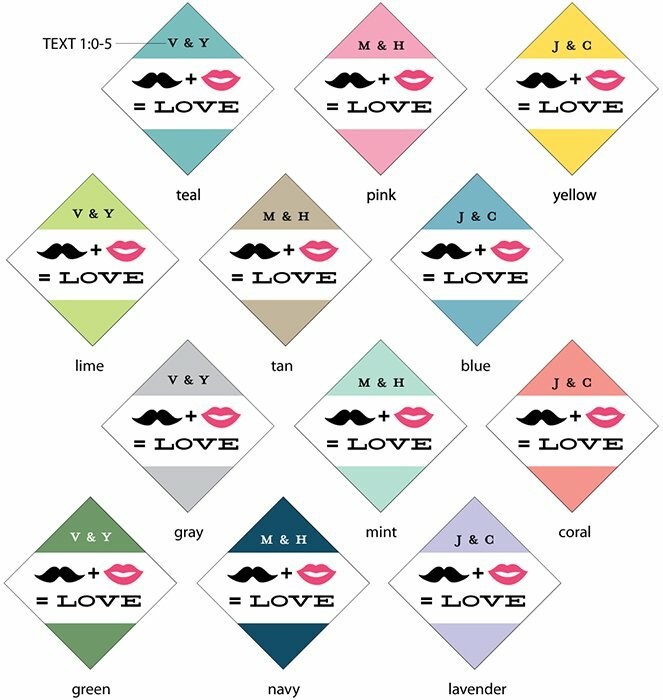 Very cute stickers but the color is slightly dull. But still satisfied with purchase. Really nice touch to personalize gifts. my sister's bridal shower favors were perfect !!! We placed a tea pot at each gues'st seat filled them with candy kisses ! They were a huge hit !!!! The bride was impressed and so were all the guest. Beau coup servise was fast and they were verry helpful. I honestly cannot find anything that was not great about the product OR the experience of purchasing it. [...]!We used these on the favor boxes for our 15th Anniversary Celebration. Beautiful! 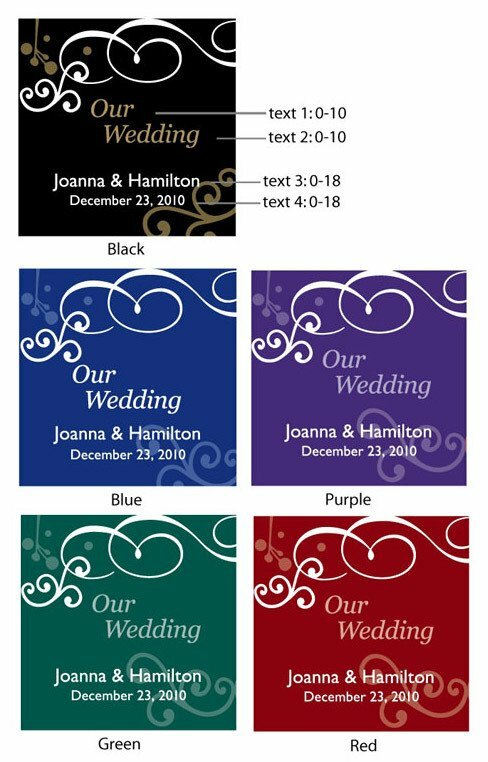 I ordered these tags for my bride and groom for wedding favors. We did a candy bar at the reception with long clear bags and gold twisties. I placed a round sticker on each clear bag and they were set out with the scoops and arrangement of vintage apothecary jars filled with an assortment of red candies. We had them customized to say "summer & tommy" "sweet on each other" in red with the white bird. I ordered the mid-sized because I felt the smallest would be too dinky and they were perfect! There were lots of compliments. They are very artsy and original looking. Great sick-on labels for the travel candles in my party favor package. 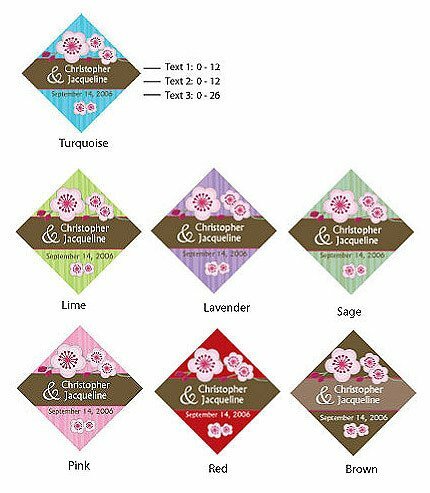 We ordered the lime green/white 2 inch square orchid labels for the embossed white favor bags. They were adorable. They looked expensive - were easy to work with. Loved them. These labels were just the personal touch needed to add to the favor bags we purchased! 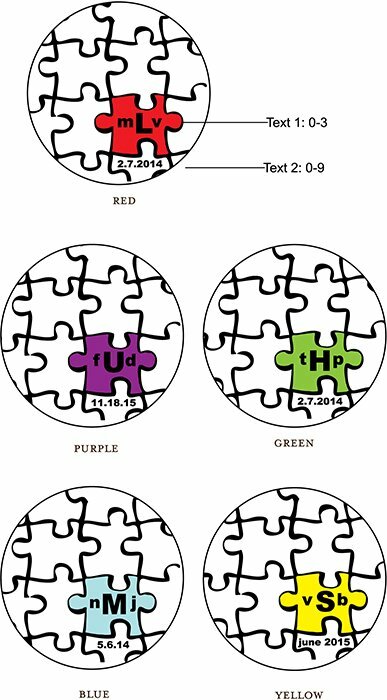 We were even able to choose the same colors used in my son's Bar Mitzvah invitations. The guests loved them and some were even noticed leaving with more than their fair share! These labels were perfect for decorating overnight guest bags for wedding! 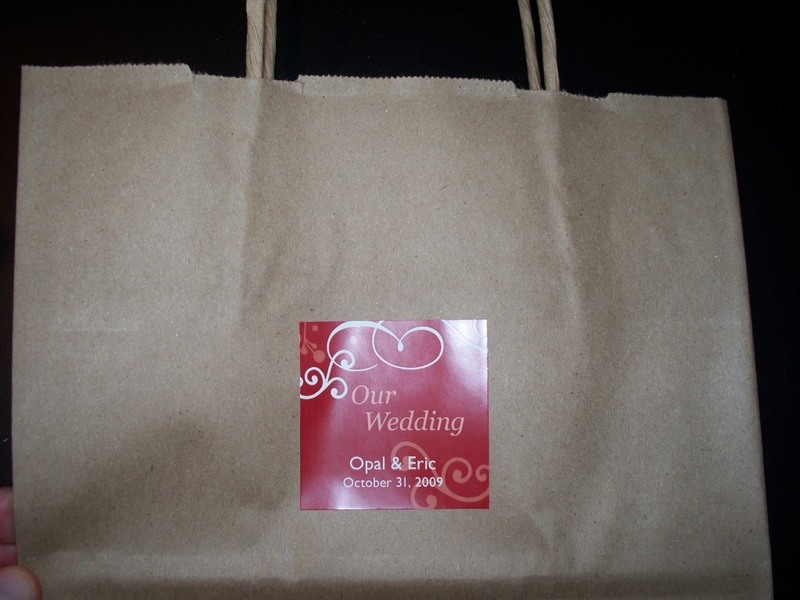 They looked beautiful on white bags with a light green tissue paper and white bows around the handles! 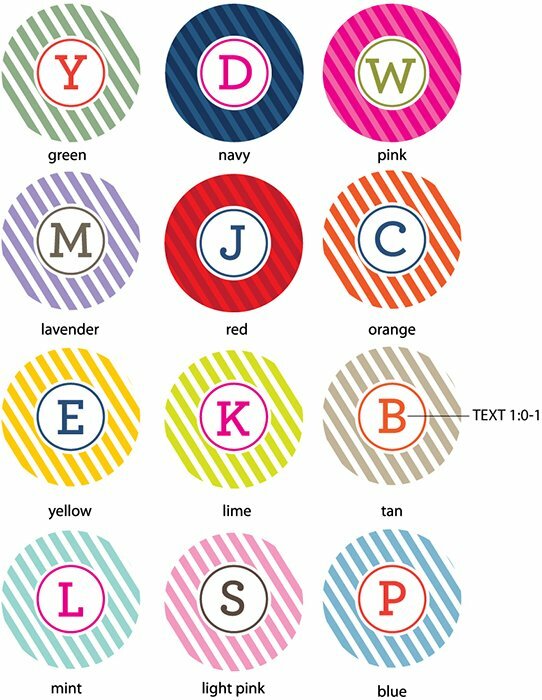 We ordered the lovely circle shaped labels to put on the front of candy buffet bags at my daughter's graduation party. Everyone loved them and thought they added the perfect touch. They were lovely and would definately purchase them again. Labels expressed exactly who we were! The labels were used on the vanilla scented candles that we used for party favors at our wedding and they were a big hit! I hardly had to think at all! 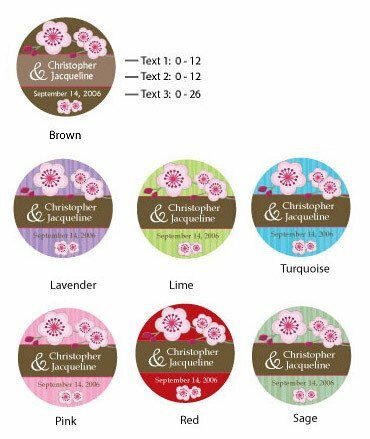 These labels are the perfect way to personalize the lovely designer cookies I picked as the favors for a bridal shower. we used for the welcome bags for our wedding. nothing bad to say! I applied the labels to bridal showers favors saying "Thanks" and the bride and groom's names. 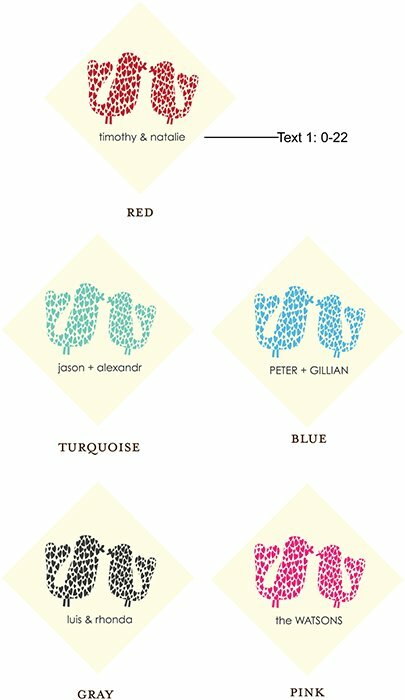 It made the favors more personal and colorful. Everyone noticed how nice they looked. My daughters wedding colors are ice blue and dk. purple,these labels were perfect in every way. 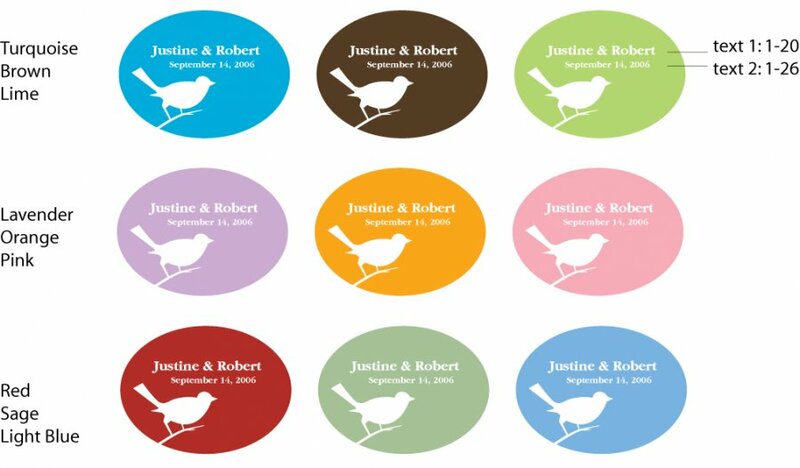 These stickers were great for our wedding favors. They were a nice size, and really looked like good quality stickers when we used them on our jars. They arrived and looked like I expected with a nice color. I wish they had been a little cheaper, but everything wedding related is expensive! At least you know you are getting a quality product. 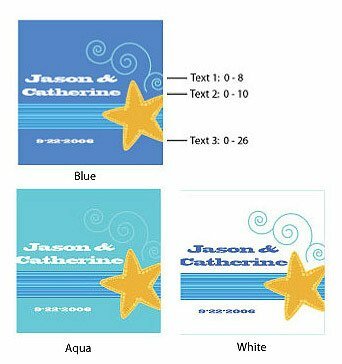 Personalized labels are attractive and came just as ordered. There were many designs to choose from which was quite helpful. I would have liked to been able to purchase a larger label with similar design. Perfect size, color, and graphic. 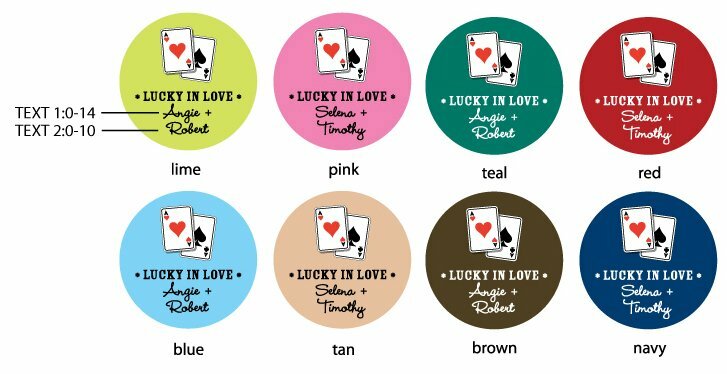 These personalized labels were placed on top of small gift boxes filled with chocolates and placed in the guests cars as an added thank you for a sweet night for our guests who attended our wedding. I like the nice clean look of the labels. They will look very nice at the reception. These will look great on the gift bags for hotel guest attending my daughters wedding. Oder these for two weddings! I ordered these twice for different weddings. The first time I used them on gift bags I made for our hotel guests. The second time I used them on the bridal shower center pieces and favors. They add a nice personal touch to everything. Loved the product for the price- I would have liked them to be larger but that was my fault since beau-coup gave the measurements. These were great. Orchids were the theme of my wedding and I had the pink and white labels personalized with our names and wedding date. They are great stickers so easy to stick on the gold little chinese takeout boxes. excellent addition to any wedding favor! 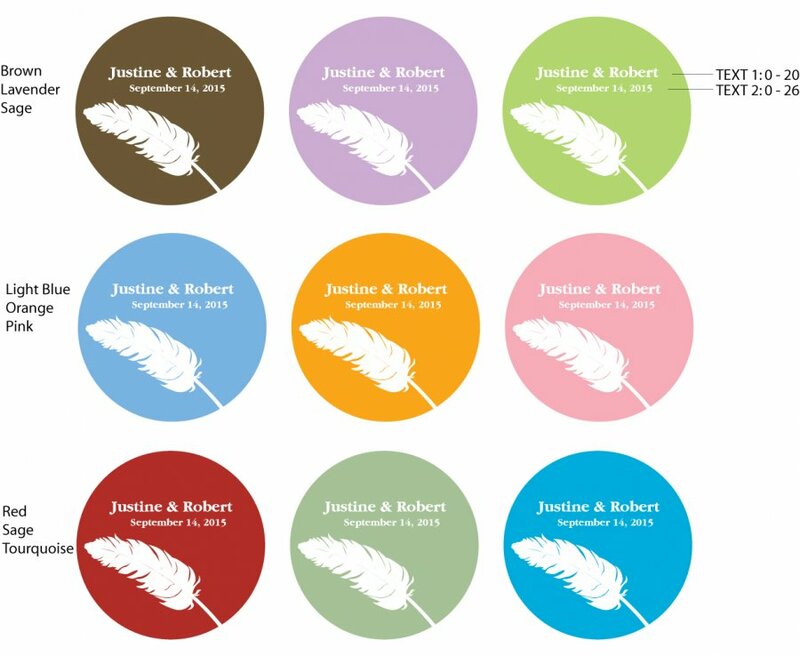 These stickers were a great way to personalize the packaging of our wedding favors. Very modern and cute! Would be best used on paper/envelopes, etc. I used them on cardboard pillow boxes and the 'stick' wasn't super sticky. :-) Great product though! I ordered these for a baby shower that my office was throwing me, along with the embossed favor bags. The designer labels were beautiful, fit perfectly, were bright in color and I was thrilled with them. [...] The labels were everything I wanted and more. I will definitely order these again when the occasion arises! We used these labels to Highlight our favors. They looked great and stuck really well. They add a nice touch to my favors. I'm very pleased! 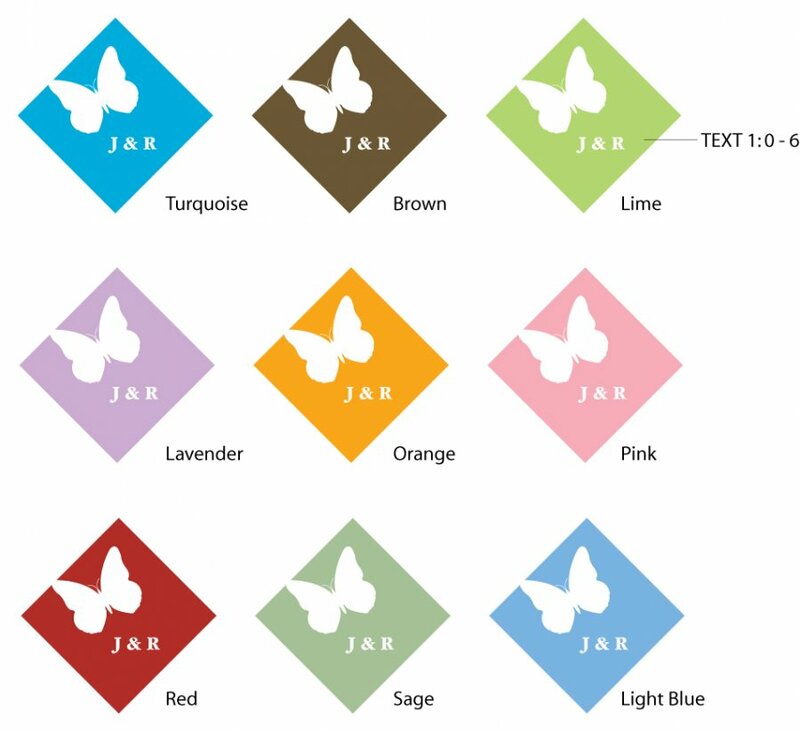 I ordered the label to use on glass candles I made for my daughter's wedding to use as favors. They were a perfect fit and I loved the quality. Should have more options of designs and better prices for more quantity! I bought these to stick on mini (4" x 3") brown paper kraft bags I found at [...]. They make the plain little bag look adorable. Love these labels! We used this product on our favor boxes for our wedding. They are a bit small, but they fit really nicely on our boxes. we were able to fit "Thank you! Love, Bride's name and Groom's name." 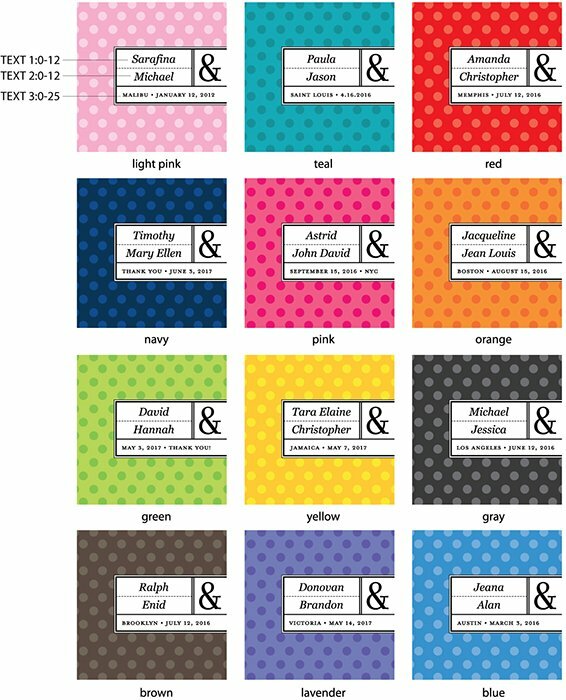 Also, they come in so many colors and designs that we found the color that matched our theme perfectly. 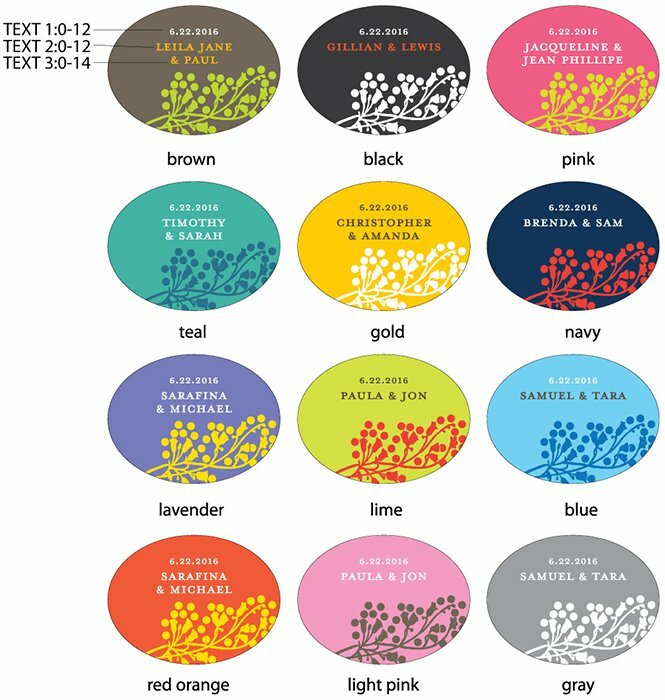 There are many personalized sticker labels but few with the delicate, unique and exquisite feel of Beau-coup's!! I co-organised a birthday party for a lady who was celebrating her 30th birthday and the labels were such a delightful accessory to the gift packs that the guests felt immediately drawn to the birthday girl's charms! 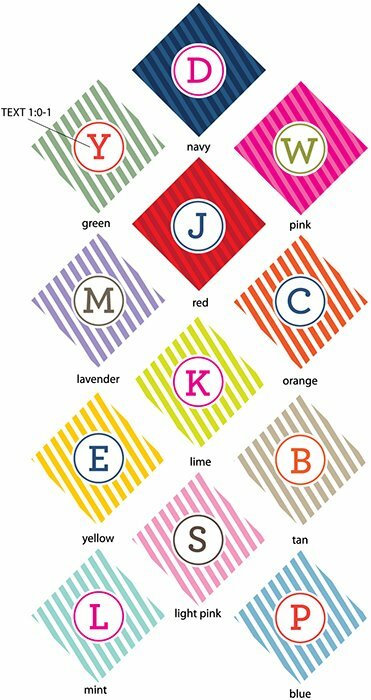 We purchased the labels to put on candy bags for the candy bar at the reception. They're the perfect size and looked just like we expected. One minor detail which the bride picked up on was a small thin green border on the pink labels. A minor detail which probably won't even be noticed by anyone but the bride. I'd buy from them again. I bought two different labels. One for my invitations and one for an enclosed CD in an envelope. They worked perfectly. Great size to hold down the flaps and not too big where it took over the rest of the packaging. 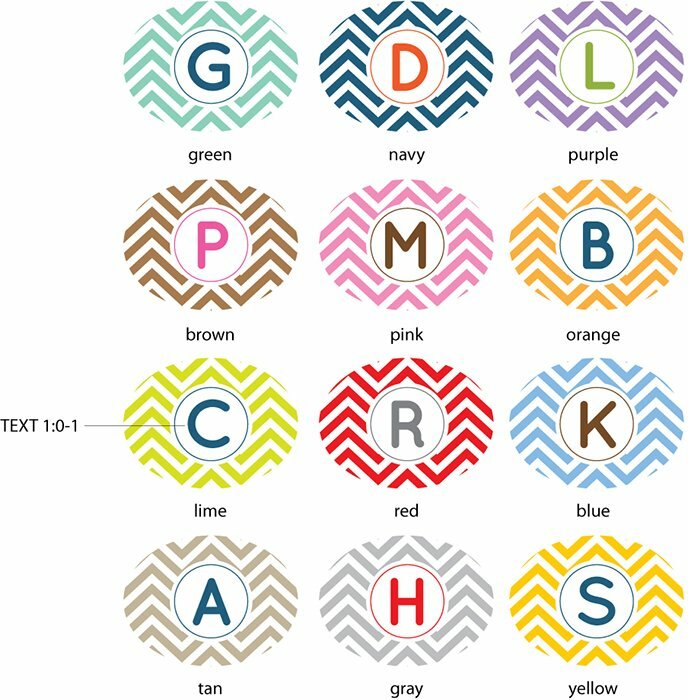 Great for personalizing simple projects! 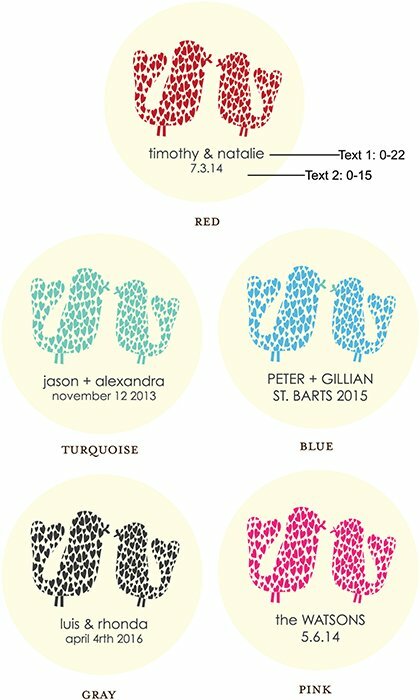 We were looking for something to personalize our simple Cookies & Milk wedding favors. These stickers were an affordable option and turned out to be a great addition to the clear plastic pouches! 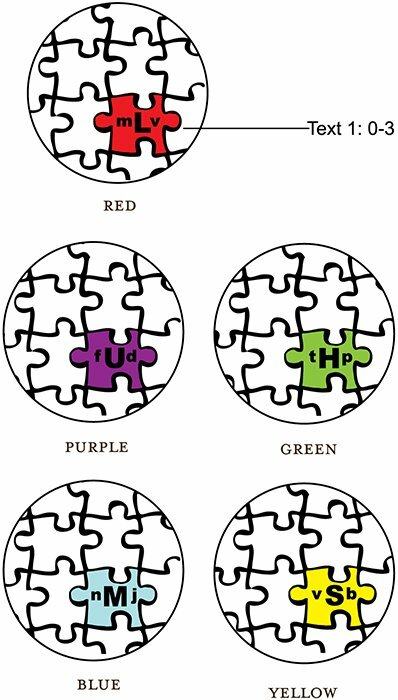 There were so many colors & options to pick from that it made it simple to find one that fit our theme and color scheme. They are perfect and I was so thrilled when they came in the mail. When I ordered these stickers I wasn't exactly sure what I was going to do with them, and when I got them I realized they are extremely multi-functional. I am using them to attach ribbon circling white pails that I am filling with candy. I chose the cherry blossom design and it looks really professional and classy, not cheesy at all like some wedding favor stuff does! The color of the labels were a very close match to what appeared online. Product was packaged well and received in perfect condition. The personalized labels were the perfect personalized touch! the item was a bit pricey. I used the label on a chinese take out box for a wedding favor. The boxes were used at a candy buffet for the guests to fill with the candy of their choice. They looked great! I was very pleased with their look and also that they were received in a timely manner. Pretty and adorable - colros were great! We used these on clear boxes filled with candy for my daughter's Sweet 16. They made her party favors look custom made! 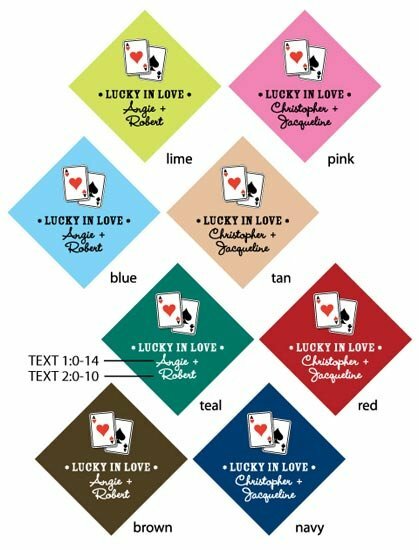 I used these labels on my wedding favors. They looks great! I brought these for the tins I brought for my daughter's 15th birthday party. The design was very nice and once all was put together it was the elegant look perfect. This product was great for sealing our favor boxes! 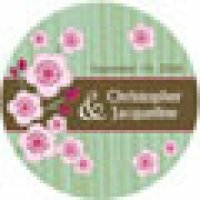 I loved them.They were exactly what I expected and very useful.I found that I could use them for more than I bargained for.Thanks for the great job.I will definetely buy more for a next baby shower due in October. Used these stickers on wedding gift bags to make it more 'personal.' Nice little touch. I used these labels for my mini travel candle favors.. They look very nice and the quality is very good. The color is vivid, the imprint of our information came out very clear. My guests are going to be so pleased. I used the labels for a small chinese pail which held candy for a baby shower. They were very pretty and exactly how they looked online, no suprises. the color even matched mine perfectly! We used these stickers along with some cute ribbon to close the lids of our tiny cake boxes. Perfect size and great colors! 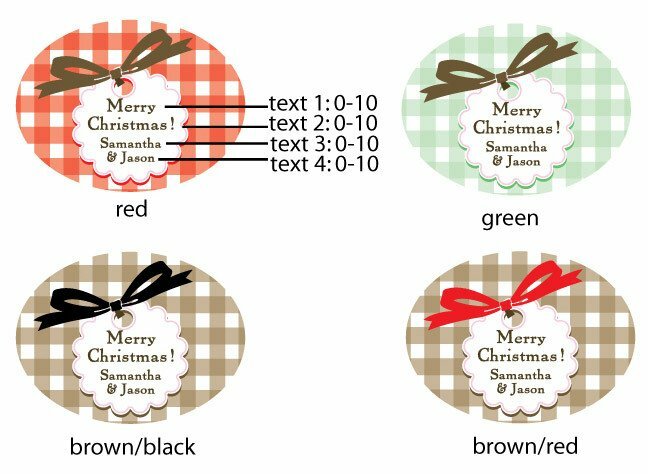 I used these to decorate round metal favor tins (I purchased the small oval labels). They were really bright and pretty, and looked very professional. My only issue was that some of the stickers were printed slightly off center, but otherwise, a great product. I would purchase them again. The personalized label that I purchased are beautiful! They are of great quality and the design is beautifully done. I am using them for bridal shower favors for my best friend's shower. I am very happy with Beau-Coup and plan on using the site again for my wedding next year! These labels are perfect on the Pillow boxes I purchased. They really personalize this Favor for the shower I am giving, plus it adds as a date reminder. I used these labels on my best friend's bridal shower gifts. They were adorable and she loved the personalized details. 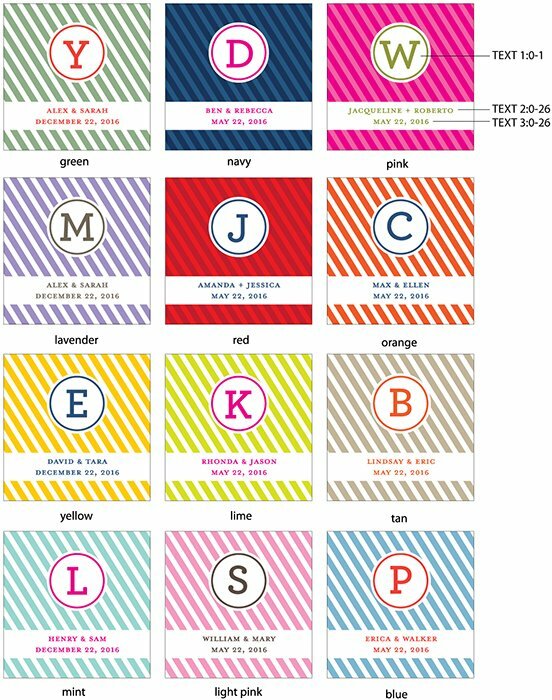 The labels are a great way to personalize favors for any party. They are very well made! I used them with the gable boxes for my MOH's engagement dinner and I loved them! I think I will be using them for my wedding in May! I used these labels to personalize the cellophane bags for our salty & sweet bar at our wedding (our version of the candy bar). The small circle labels were perfect. Just enough pop of color! The wedding labels added the perfect touch to my wedding favors. It took my candy boxes from ordinary to beautiful. I am using the personalized labels on favor boxes for my 30th birthday party. I am a self proclaimed artist, so I pay a lot of attention to detail and quality. These labels were better than anything you can print up yourself at home and at such a great price. Best labels I could have bought! 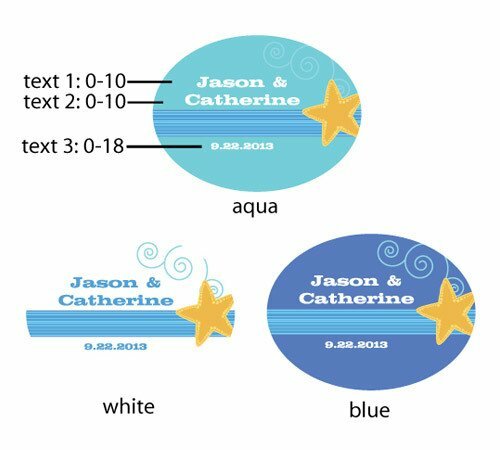 I had been looking at a few sites to find stickers to place on wedding bubbles and also on shower favors. I wanted our names and the date. The stickers I got even had a monogram watermarked in. LOVED the color, the design and size were exactly what I expected and best of all, they were very affordable. I had a hard time deciding between all the designs on this site...I would buy here again in a second! 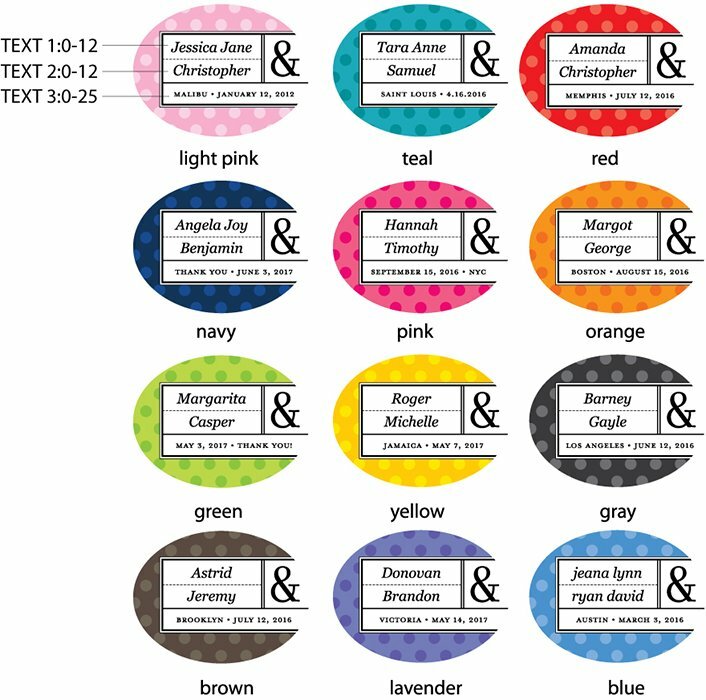 I purchased these printed labels to attach to a clear plastic bag that I am using to fill with an edible favor. The cost was minimal with a huge presence to the design. These really make the package very appealing. 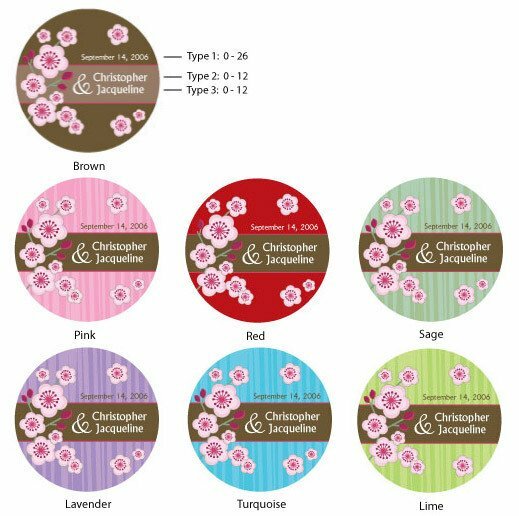 These lovely labels are just perfect for personalizing gifts, canning labels, etc. 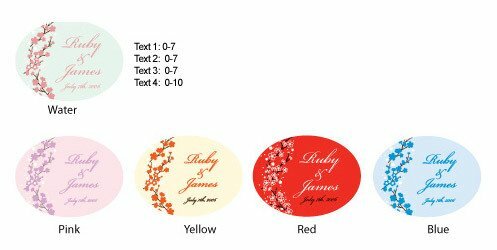 I used these labels in the red color to use with a white box for a bridal shower. They were a huge hit! recommended label too small for lid. I liked the selection very much. I loved the product I bought. The stickers were used for my save-the-dates and we received many, many compliments on them. The order was timely and perfect. I would not hesitate to order again. Very Impressed with my order! I LOVE THE PERSONALIZED GIFT LABELS. THEY WERE SO PRETTY, EXACTLY WHAT I HAD IN MIND. THEY LOOKED SO NICE ON THE EMBOSSED GIFT BAGS. I CAN'T WAIT FOR THE NEXT OCCASION TO SHOP FROM THIS SITE. I purchased several designs as a gift for my sister who was looking for customized canning labels, and we were both delighted by the results. It takes some creativity to re-purpose the designs, but it's very possible. 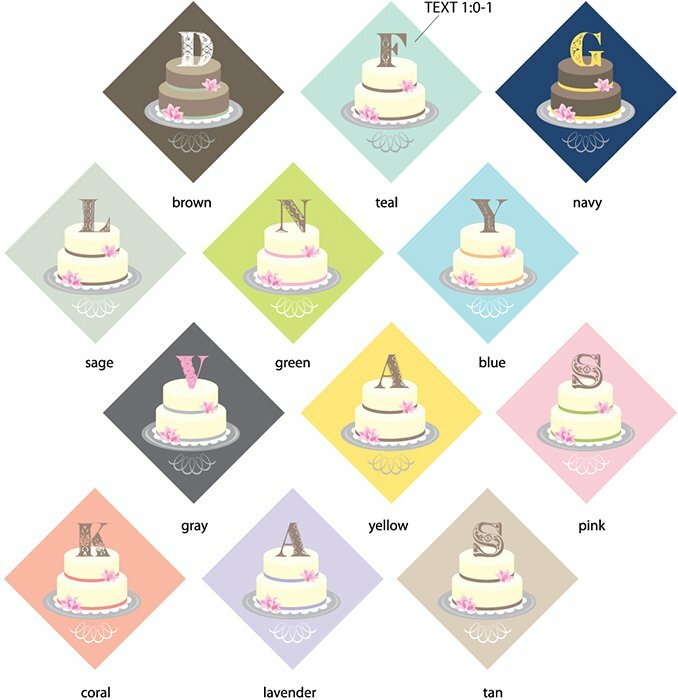 (Try using YUM in the monogram space for some designs!) The variety of shapes and sizes makes these appropriate for all sizes of jars and bottles as well as boxes of cookies and sweets. 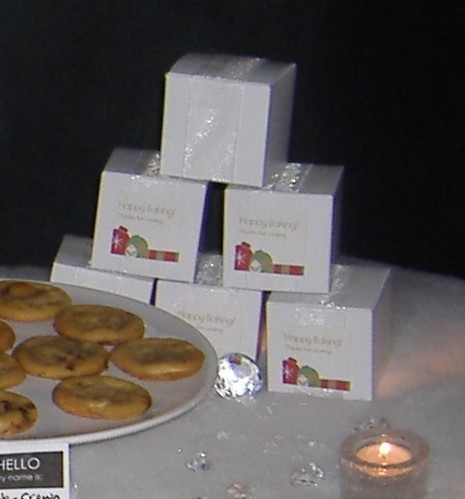 We used the labels to hold the gift box lid together that held the treats. We also used it to seal the napkins wrapped around the utensils. 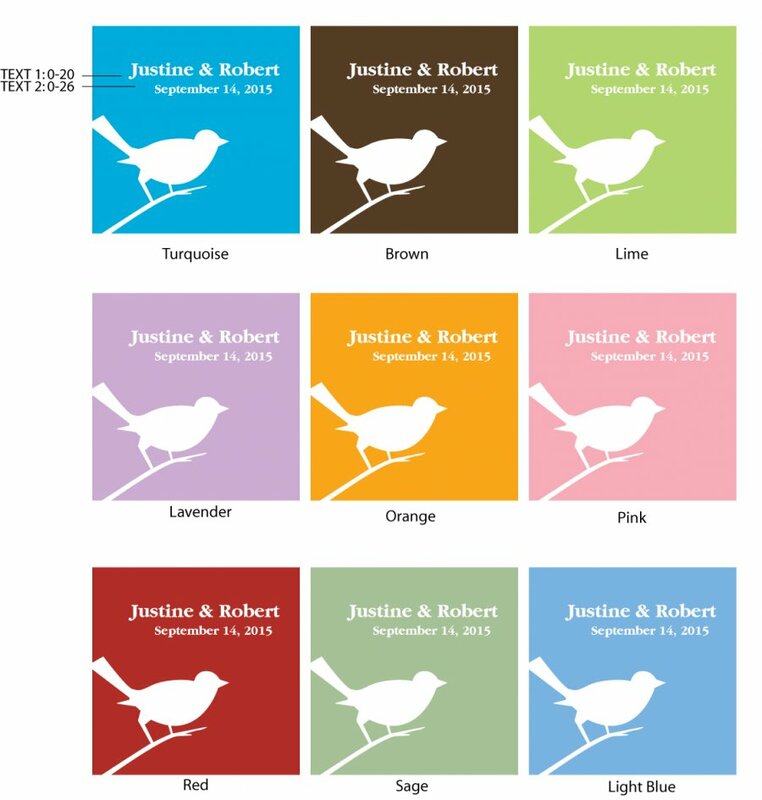 We used the design of the two birds as inspiration for a design that we are using throughout the wedding on invitations, programs, etc. thanks for making my gifts more personal. 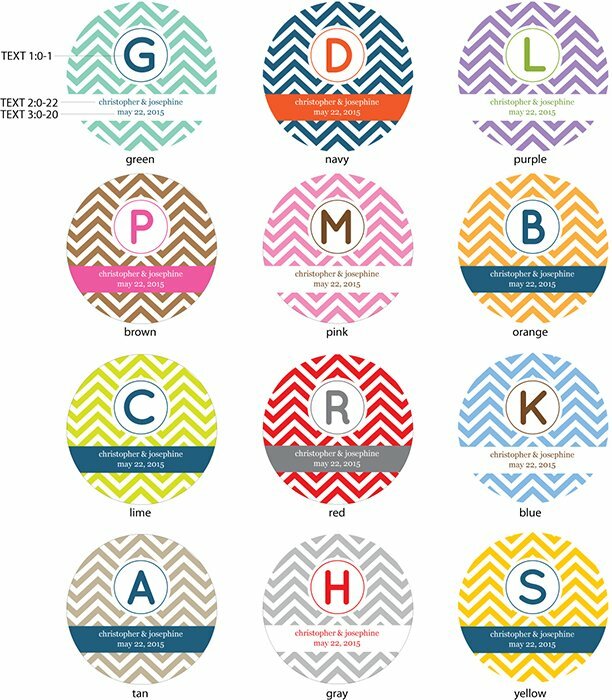 I used the personalized labels for my friend's baby shower. They turned out so cute and I know that everyone will be impressed! Used this to seal my wedding invitations. It was the perfect personal touch. I used this product to make an original label for the gift. There are so many design selection that you can get more satisfaction than an ordinary label that you can order or create by yourself. And the price is more than reasonable for this quality! Added the perfect touch to the tins..
the looked cheap, but the labels worked it's magic. I absolutely love this product. I used the labels on chinese take out boxes which will be used as favors for my upcoming wedding. The boxes will be filled with candy. 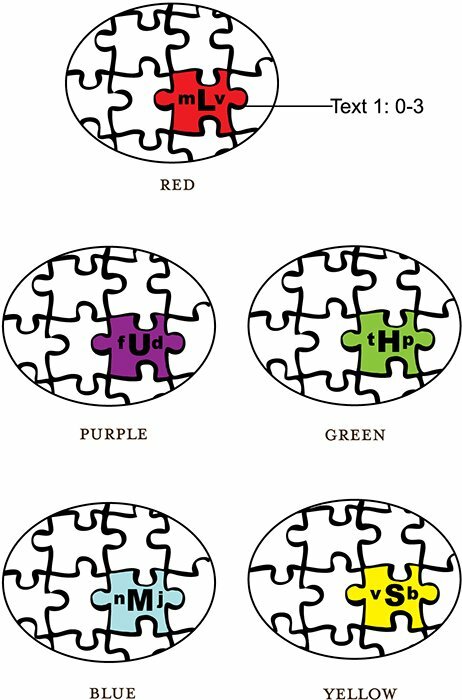 [...] I wasn't sure how the colors would work and I was emailed a proof. The labels were small, but I honestly chose the wrong size. 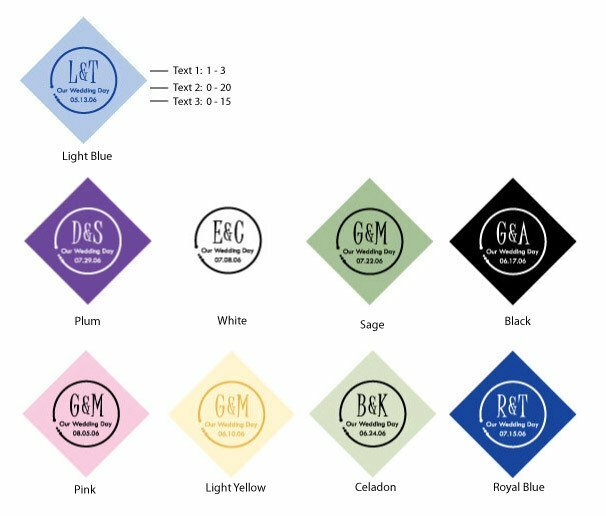 I was so pleased when our labels arrived as they were the perfect 'added touch' to our cupcake boxes, also purchased on beau-coup. [...] no mistakes and in excellent condition and quality. The print job looked great - thank you! Beautiful & not found anywhere else! Wrote bride and grooms name on the lables, placed them on glass candle holders, and gave them as gifts to all our guests at the wedding. I used this product to state the date with my fiance's and my names. Placed one sticker label on cellophane bags filled with neuget and tadah, perfect gifts for our guests! There was lots of patterns to chose from as well as colors making this item the perfect match for our wedding. And it saved me a ton of time! To think I was going to try and make these myself!! Sillyness! Beau-coup took away all the work and time I would of wasted trying to do it on my own. Plus this worked out cheaper! Win Win!! Professionally Done and Great Colors! We put these on our mini travel candles. They were easy to remove from the sheets. The colors choices were very contemporary. It was a really good value for the quality. This product was exactly what I was looking for to place on my candle tins as favors for my wedding reception. Although the coloring wasn't as bright and vivid as I expected, they were still lovely and I am quite satisfied. The stickers were fantastic - colours matched exactly what I'd seen online and they looked fantastic. We used it as our party flavors held overseas. They looked so beautiful & unique. Definitly worth it. 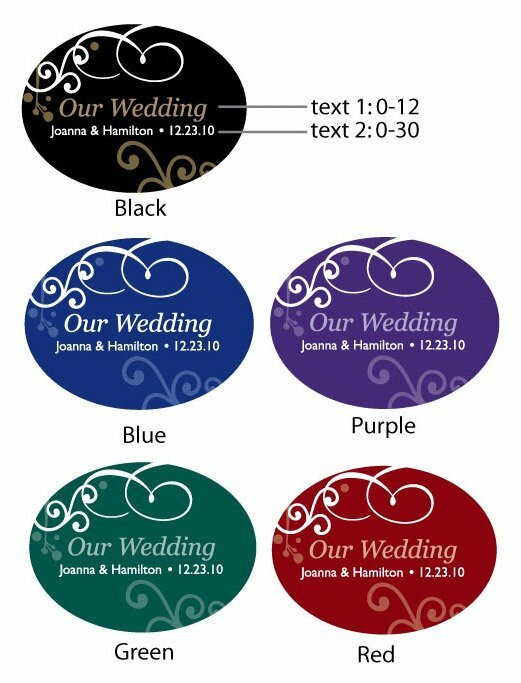 I am using the large 2 inch labels for my wedding favors. My favor is an espresso cup and saucer. I placed the cup & saucer in a 4x4 clear plastic box and tied ribbon around the box. I fastened the ribbon on the top of the box with the label instead of tieing a bow. 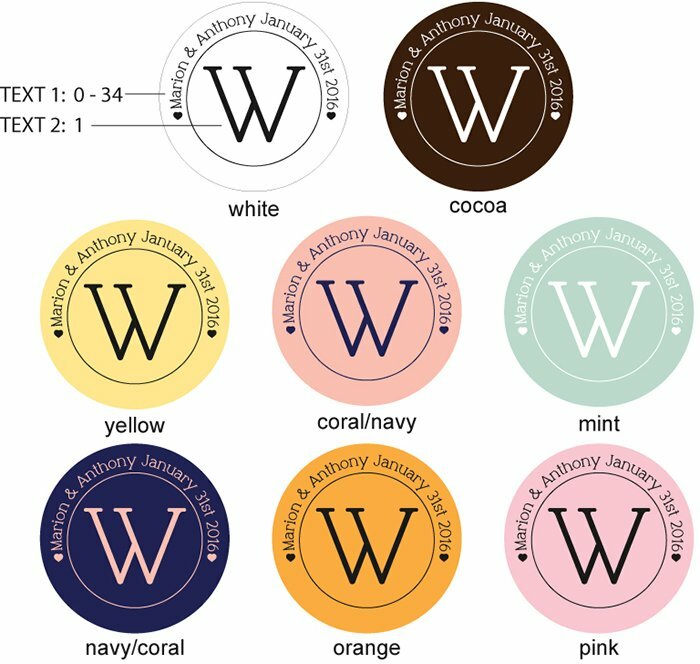 My colors are tiffany blue, brown and white. 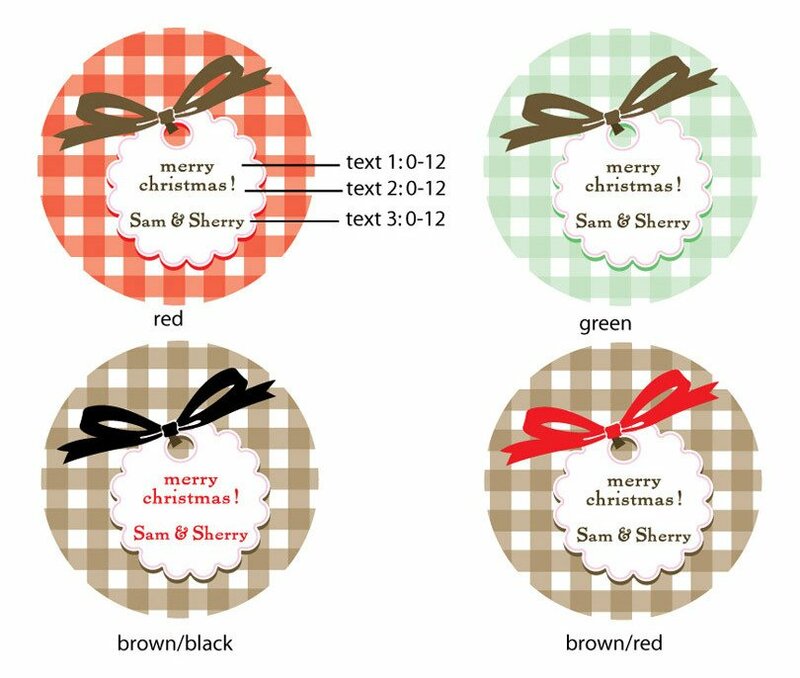 Since the ribbon was tiffany blue and the cup & saucer white, I ordered the brown labels. I am extremely satisfied with the quality and size of the labels but I am disappointed with the brilliance of the brown. Its not a nice chocolate brown like I had hoped for...instead its a very dull brown. Worked just how I imagined! 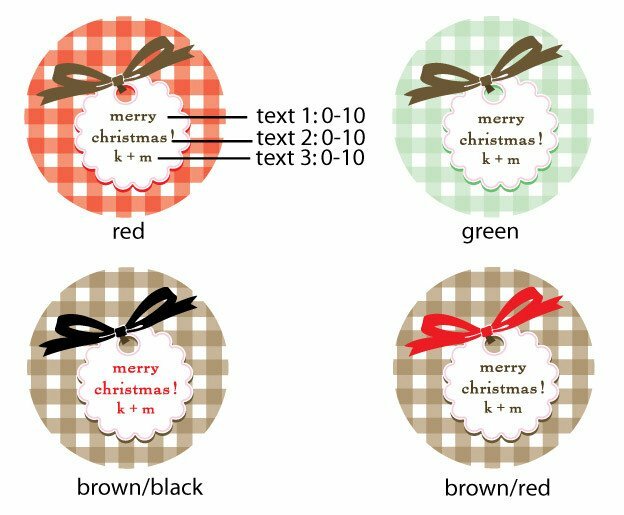 I used these labels for my holiday cookie packages, as well as having some made for my cupcake business, to place on the boxes. These are great fun, inexpensive and beautiful. Now I can't wait for my wedding DAY!!! I used these labels on gift bags. The design was very cute. I had them printed in pink with a little bird and a quote. I felt like mine was printed at the end of an ink cartriage. i would of been disapointed if it was for a wedding favor. But since it was just for a shower I was fine with it. 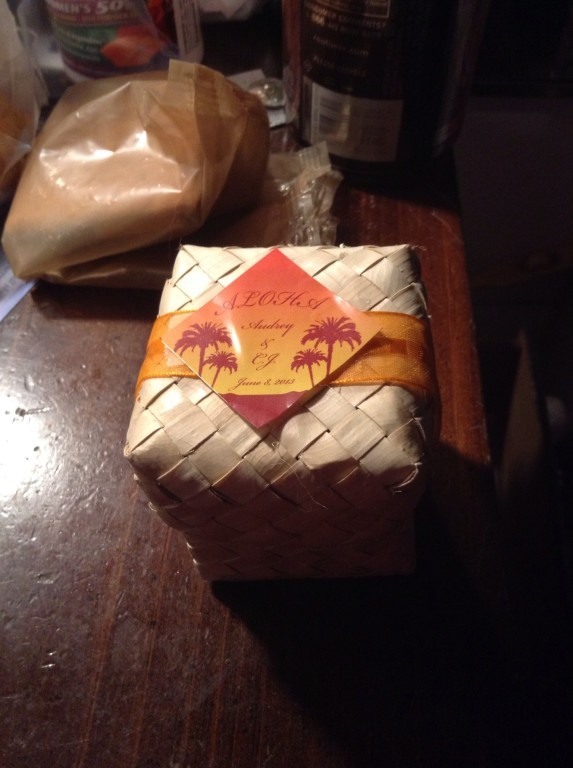 Perfect addition to travel candles! The labels fit perfectly on the travel candle. The image and writing are clear and attractive! I used these labels on candy tins for my candy buffet, and they turned out GREAT! The labels came in the mail so quickly and they are adorable. I'm so pleased with them and can't wait to use them for my wedding!! The labels were beautiful and added an additional touch of elegance and personalization to our outside wedding. They looked more expenseive than they were and I just loved them! I am using the labels for the boxes at the candy station at my wedding in June. 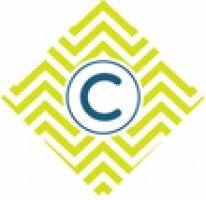 Everything from this site is amazing! These labels are a reasonable price and very well done. Just perfect! 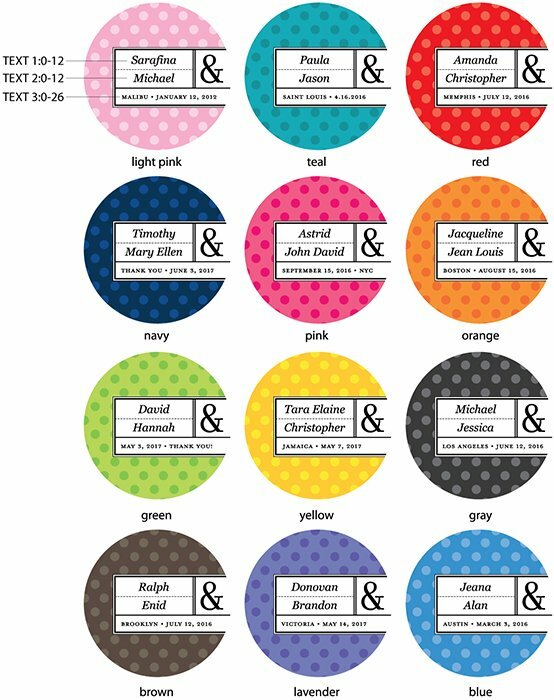 I purchased these personalized labels to use on the favor boxes for my wedding reception. 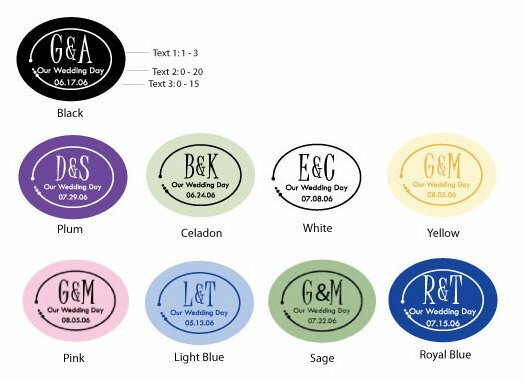 I had a hard time finding supplies for my black/purple/bright blue color theme, but these labels were perfect! They are different than what you see out there, very cute modern designs to choose from. I am very pleased with the way they turned out! Like the use of bold colors. Excellent for so many things! Loved how they turned out and the size was not too small or too large. My guests at my wedding loved the personal touch! 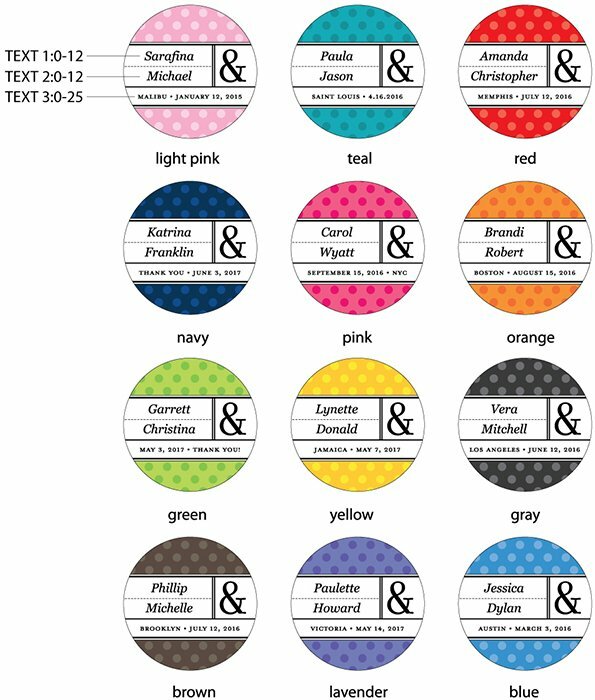 Great for sticking on the back of a thank you note envelope or goody bags at a wedding. These are really nice quality labels. We purchased these to go with the candle tins. They are inexpensive and they add a nice personalized touch. Loved it! The sticker put a final touch to my wedding cd favors as a sealer for the envelope. I am still receiving compliments!! This is my second order on these stickers. The first were used on pink chinese boxes for a girl baby shower. They received the highest compliments. THe second I am using the same way but at my wedding on the candy to go boxes. They always turn out great and look very similar to what you see online, which is hard to come by with colors and layout sometimes. I got these to personalize the custom fortune cookies for a baby shower and they were a big hit! Best company in their class! Everything was great [...]Beau-coup by far had the best designs, so oh well. I used these labels to add a special touch on the sake cups I purchased from Beau-coup as well. There was a picture of the labels on the sake cups that I used for my husbands 40th birthday. The service was great, it was speedy and the personalized touch felt like a boutique purchase. I would definately use Beau-coup again. I used this product for weekend welcome bags for my wedding! They were cute and personable! Everyone loved them! 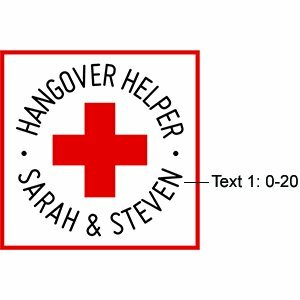 I ordered the labels for a 40th Birthday Party, it gave my little boxes some extra flare. Great product and can be used for anything. Also for any event you might have. 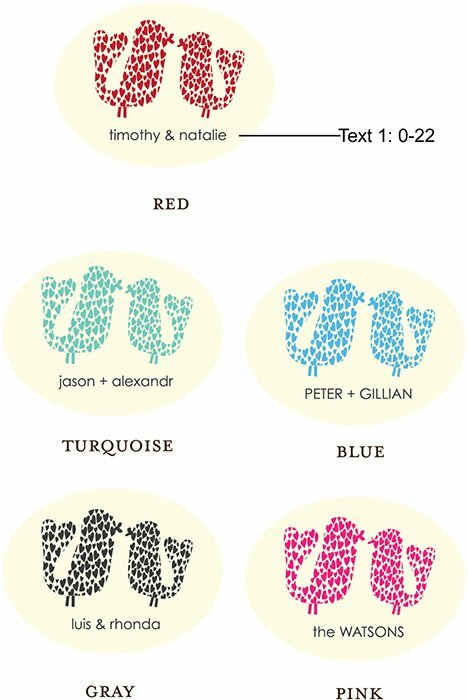 we got these stickers to put on our favors (caramel apples) for our wedding. they turned out perfectly. 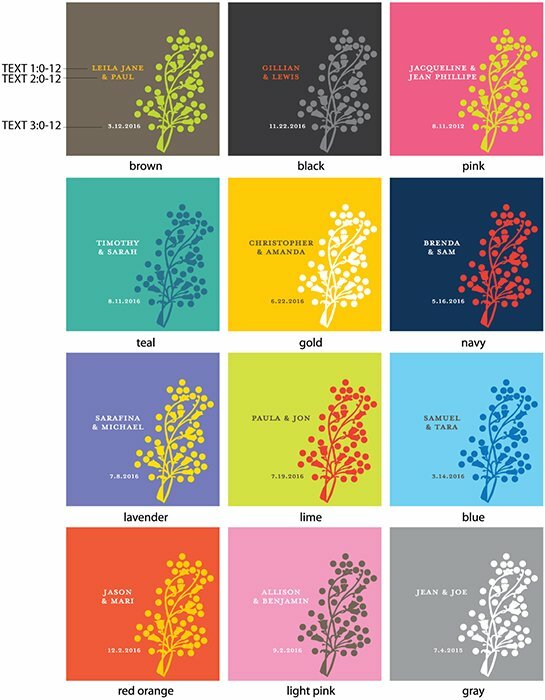 the colors were great and they were very affordable! 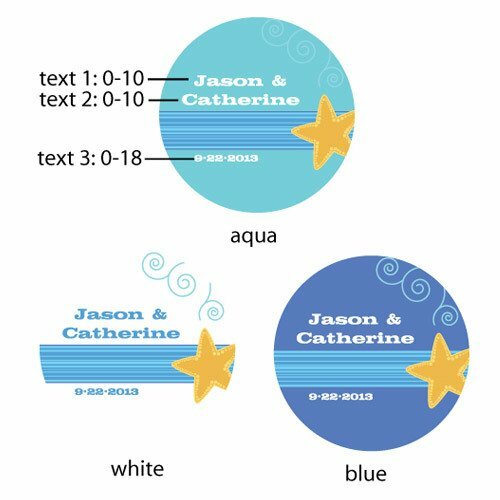 I ordered the Island Star fish labels as a suprise for my friend's beach themed wedding. They loved the labels and asked we where I bought them. I will definately order from you again. 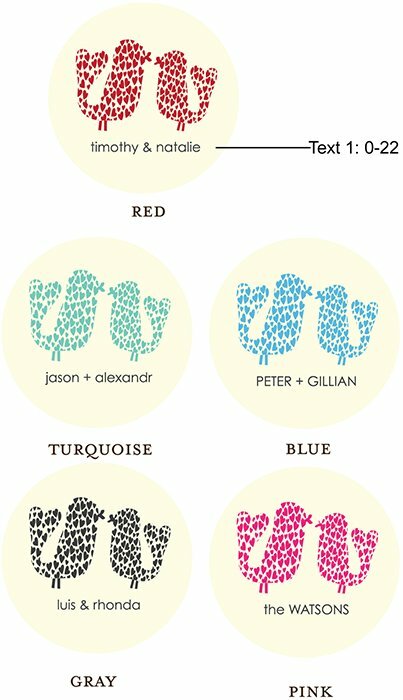 I used the 1.375" round circles as envelope seals, i personalized them and they looked adorable when i sent them out on my save the dates. I received lots of compliments and they were way less expensive than buying actual seals. I will definitely do this again! Q:I am interested in the 1.375 circle classy casual. Are the colors able to be changed? 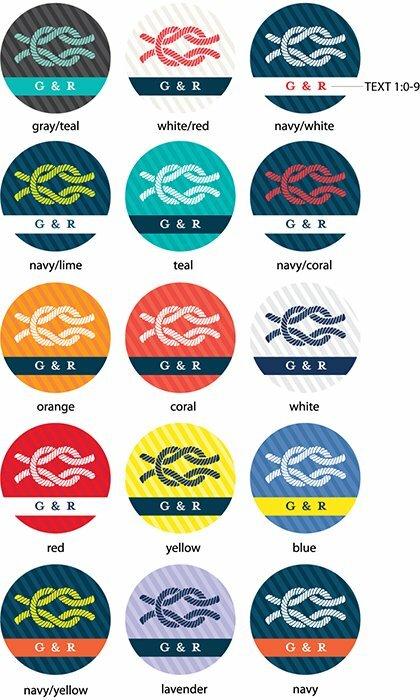 I am interested in the coral/navy and navy/coral, however would like the coral to be darker. 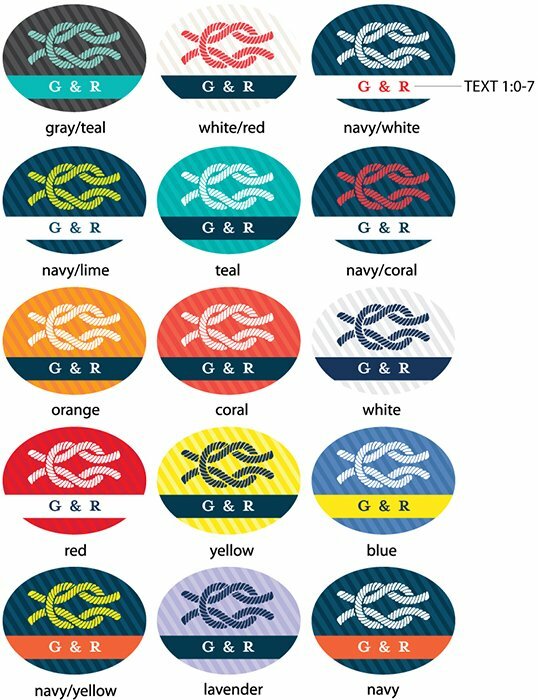 If not I would like to know if the coral letters on the navy sticker could be changed to white. 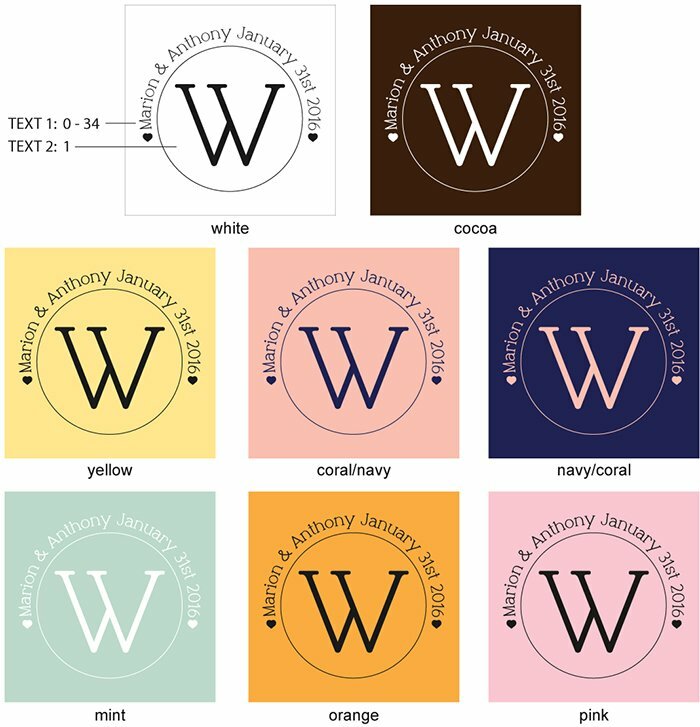 A:The colors of the text and the design cannot be changed. We apologize for the inconvenience. Q:What is the finish on these labels? Is it glossy or matte? If the labels get wet, does the ink wash out? A:The labels are not waterproof. There is a slight coating, but they are paper labels. 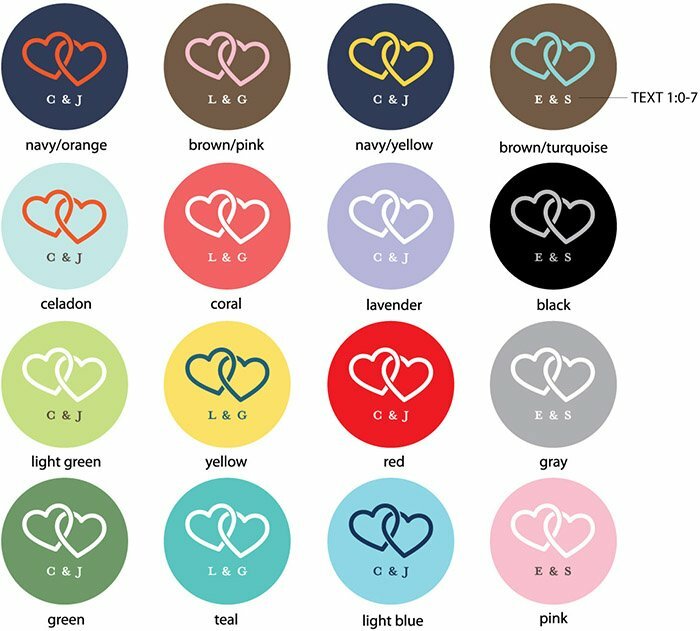 Q:Are you able to print any logo on the stickers? I have a personalised logo I would like to print on the stickers so please let me know if this is possible. Thanks! A:Custom artwork is an additional fee of $25.00. 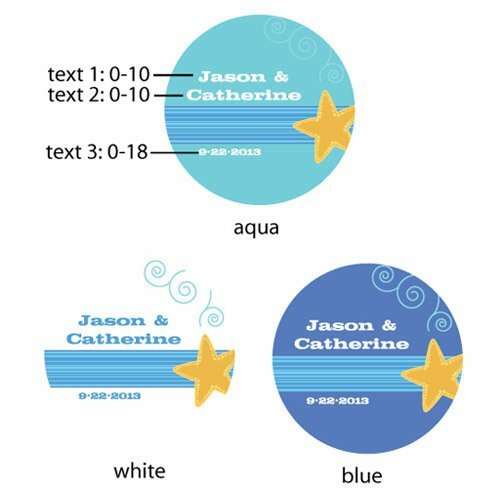 Q:In the tropic 1.375" sticker, is the "Our Wedding" included and I can add 4 lines of customization, or does "Our Wedding" count as the first line? A:Our Wedding is not defaulted, and is text line 1. Please click on the "tropic" design for text lines. Q:How many labels are on one sheet? 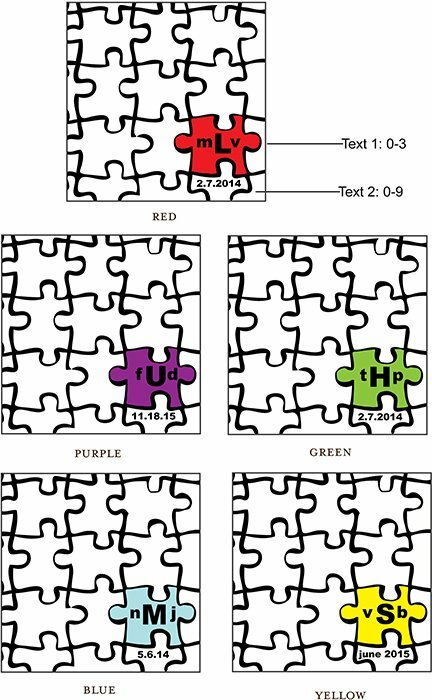 A:The number of labels per sheet is located in red under each shape. Q:Are the text lines 1 and 2 printed on the same label or are they printed on separate labels? A:Text lines 1 and 2 are printed on the same label. Depending on the design even up to 4 text lines. All printed on each label. Q:Hi, Can I print Chinese characters on the personalized stickers? A:We are only able to print in English at this time. A:We do ship to Australia. Before you order, please view our international order policy by scrolling to the bottom of the page and clicking "International Orders" under Order Info.